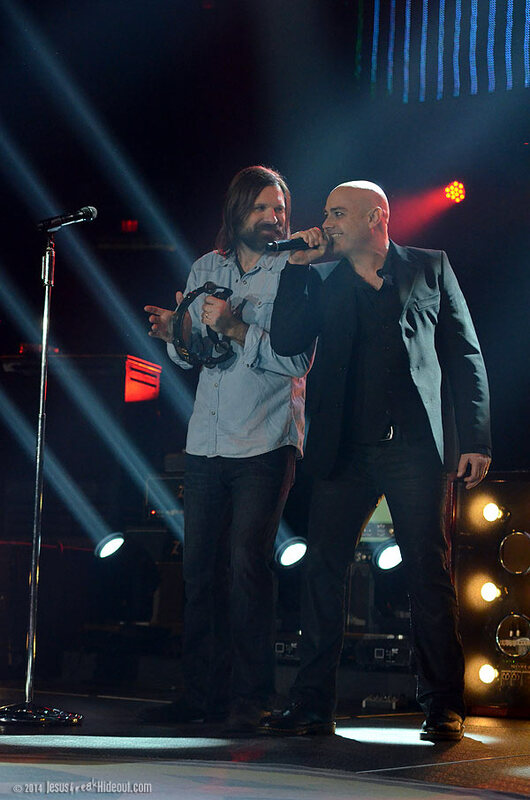 I've always found it tricky to merge show coverage (i.e. 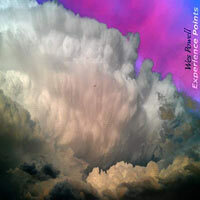 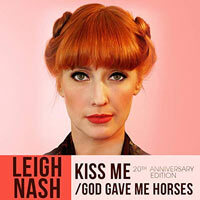 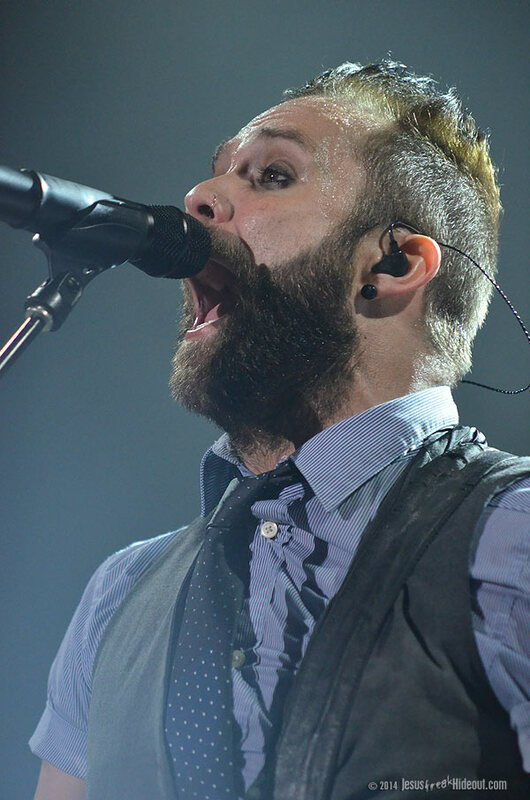 these concert reviews) with taking advantage of these events for in-person interviews. 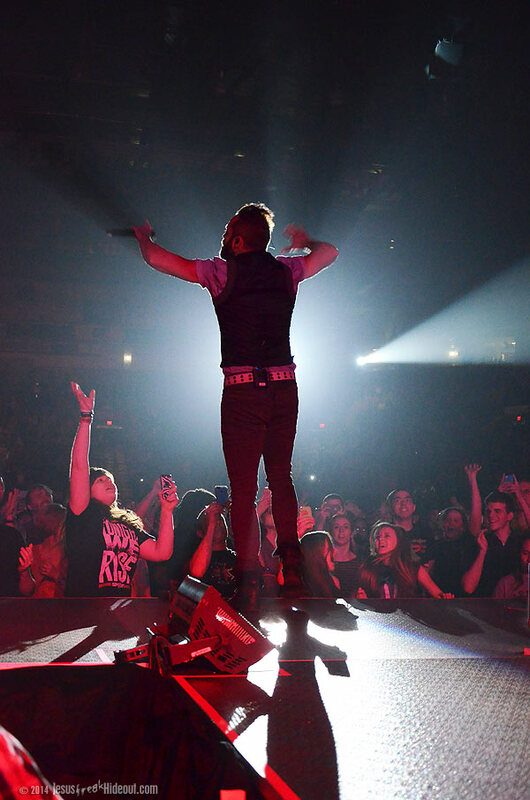 Granted, each tour I attend, there's usually one or more artist I'm really excited to see over the rest, but still, for tours like these, I like to be able to present to you a well-rounded experience of what you can expect at a tour like this. 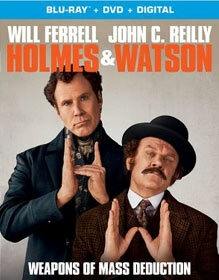 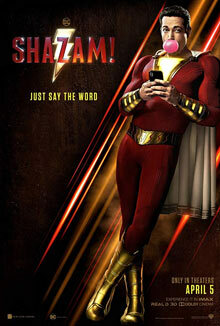 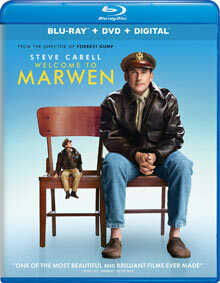 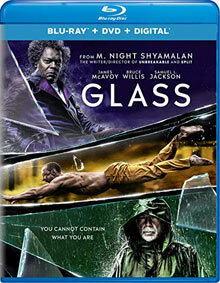 Unfortunately, this won't be one of those reviews. 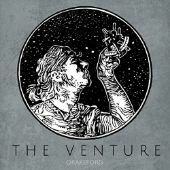 Before some of you get your feathers all ruffled about incomplete show coverage (and, judging by some emails I've received over the years, there are some of you out there), please understand that we're often at the mercy of the schedule of artists who, in turn, are also at the mercy of our schedules. 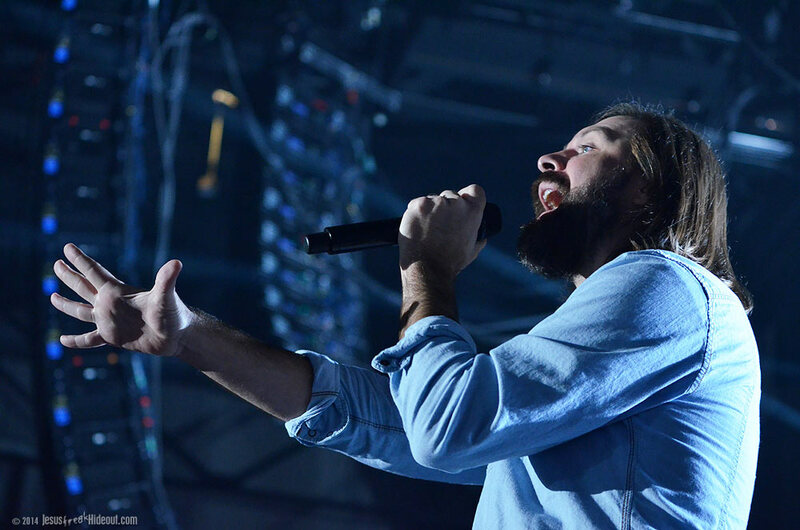 For example, an early, shortly-after-noon interview isn't usually practical for us (who sometimes have to travel a couple hours), while interviews for the artists just before showtime (or during showtime) could conflict with meet-n-greet sessions or even their dinner. 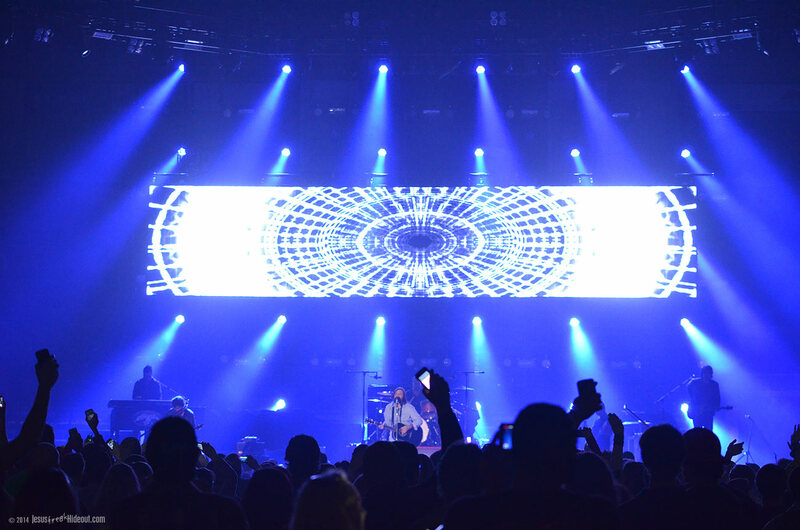 So, on this particular evening, the only time we could work out a sit-down with an artist on their tour for an interview, was at the start of the show. 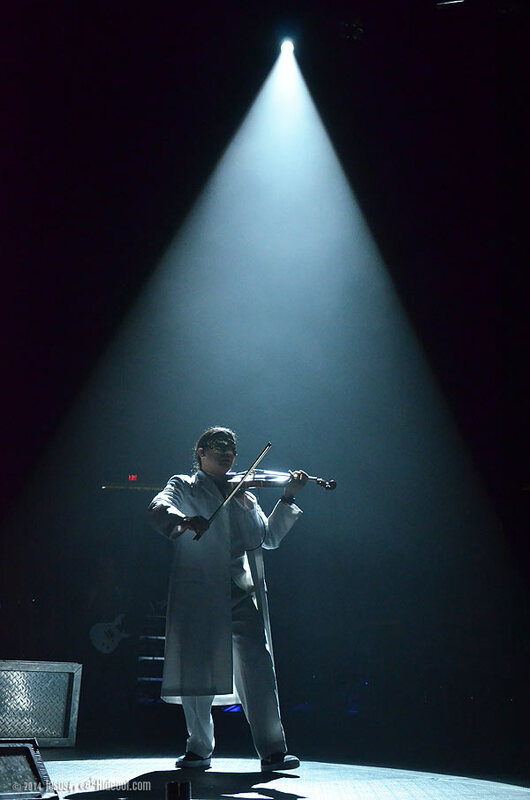 And, all things considered, this meant we missed the first half of the night's musical offerings. 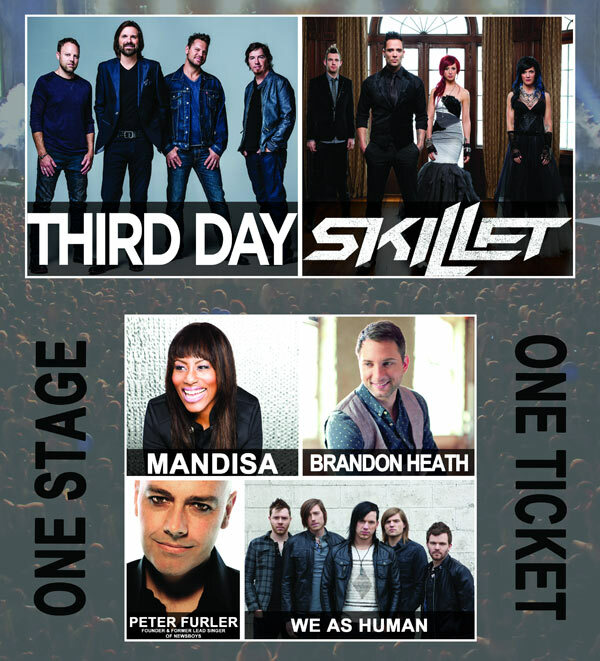 Still, with recent festival visits and shows like The Hits Deep Tour, one can kind of know what to expect from shows from We As Human and Brandon Heath and Mandisa, but the drastic stylistic differences and contrasts between all three artists (We As Human is more akin to Skillet while Heath and Mandisa are prime AC radio fare) certainly makes for a varied and eclectic mix of music for one night. 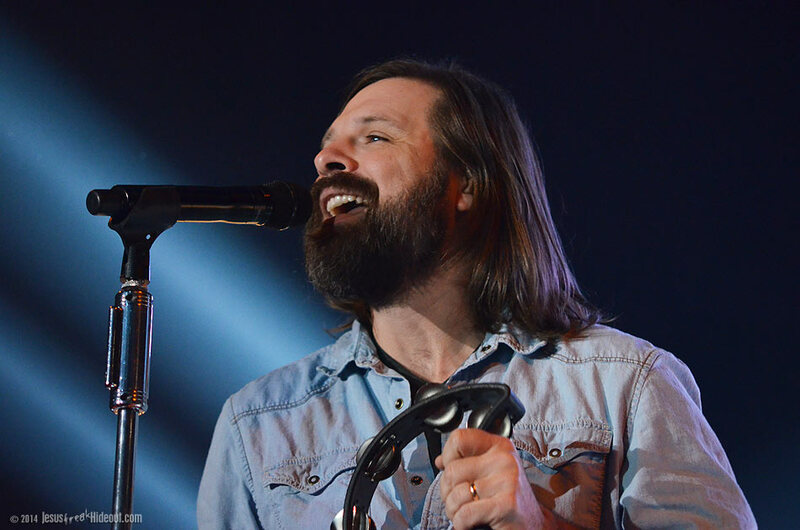 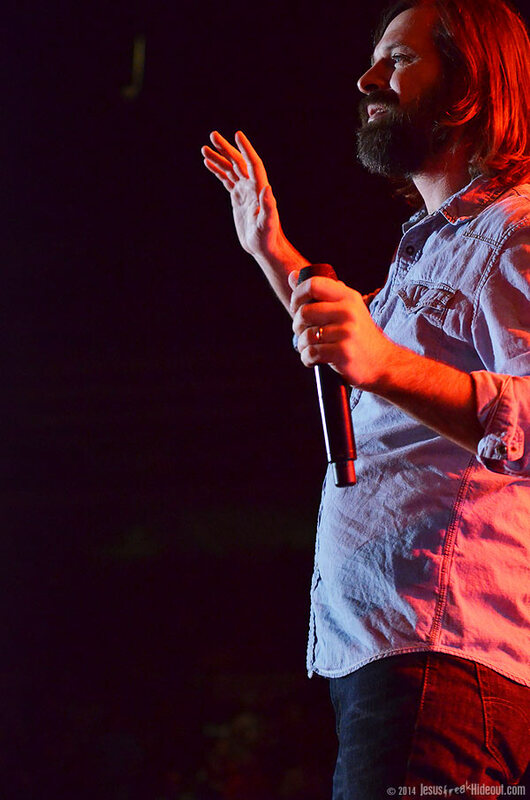 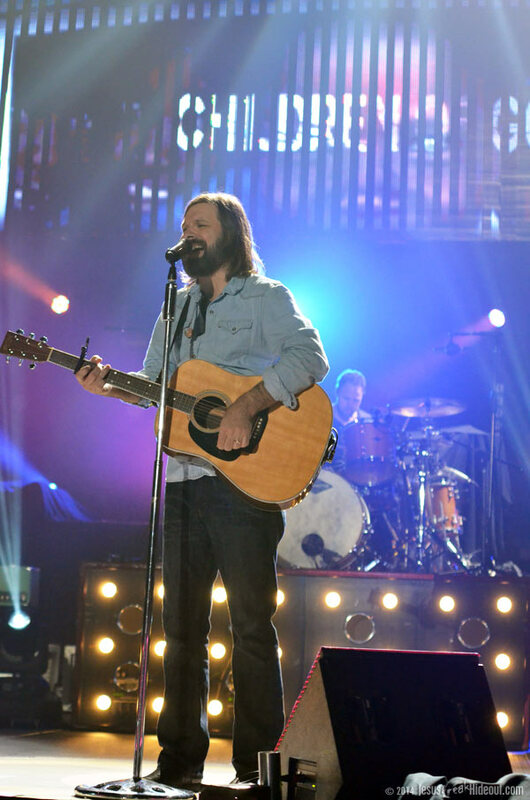 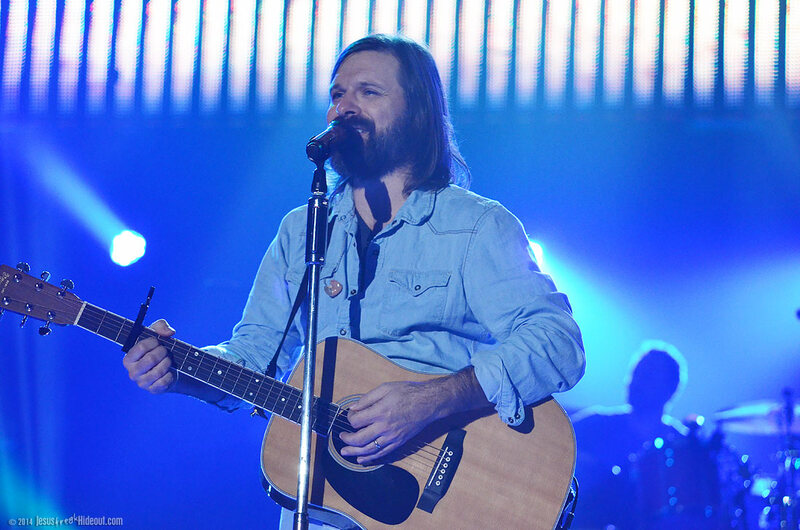 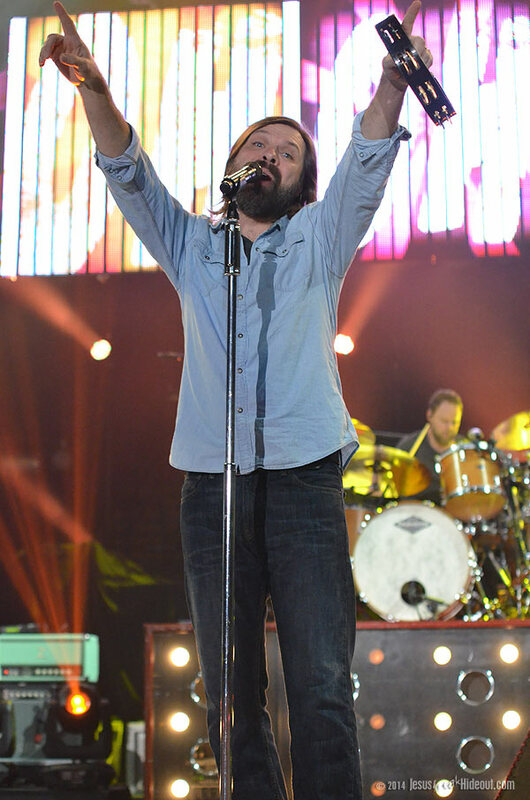 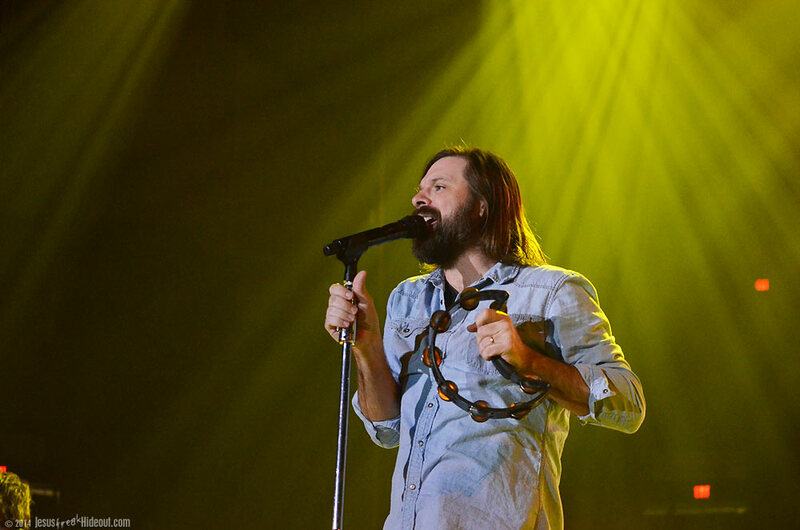 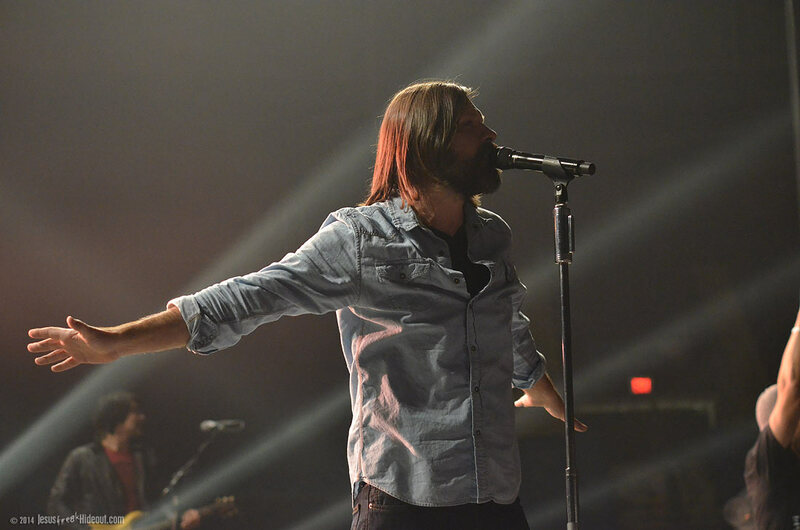 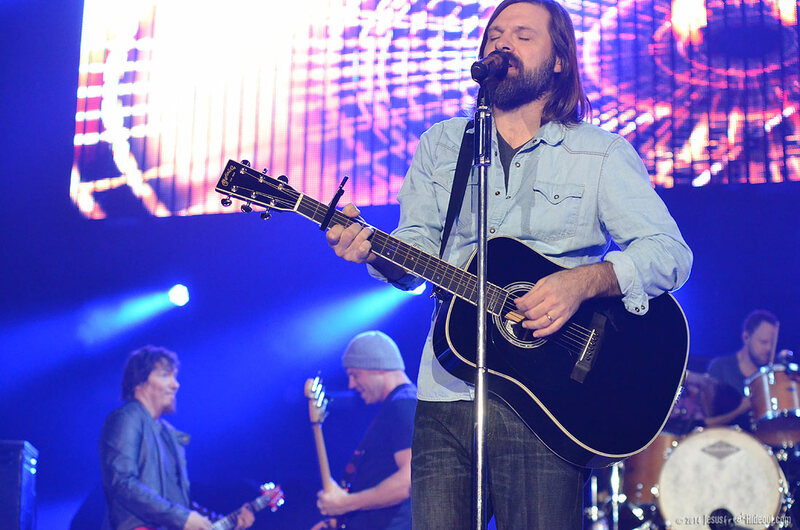 We didn't make it into the crowd area of the Santander Arena until the tail end of the Food For The Hungry sponsor message, and it wasn't too long after that that Atlanta rock band Third Day took the spotlight. 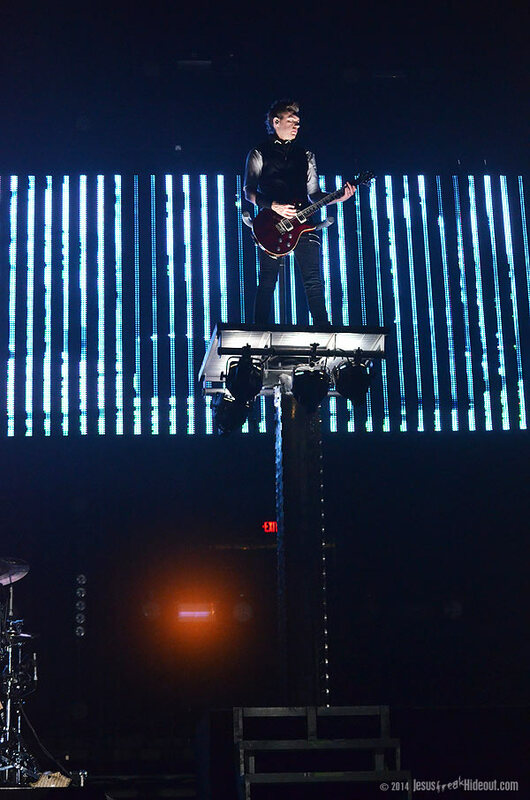 Much like Winter Jam this year, a catwalk extended from the middle of the stage, but instead of slicing through the audience in a "T" shape, the catwalk ended with a tiny rectangle stage at the end of it -- something that would be used in a unique way after Third Day's set. 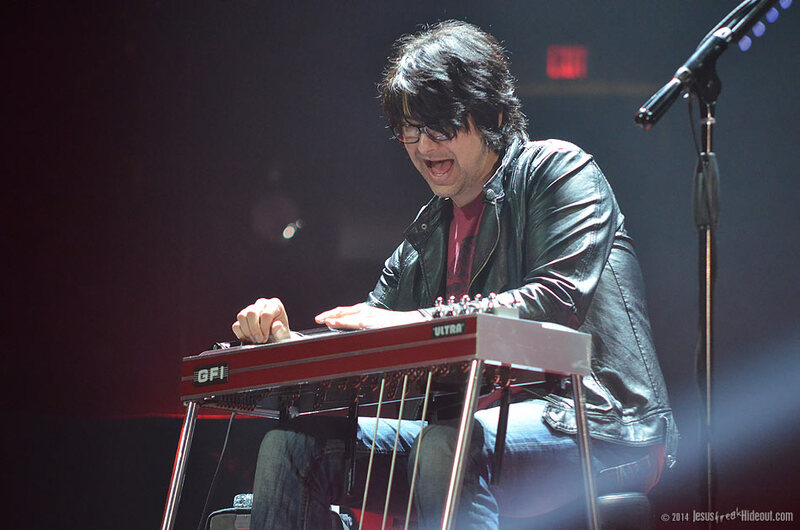 But the 3D boys opened with the rocking "Otherside," complete with DecembeRadio's Brian Bunn on the pedal steel guitar for accompaniment. 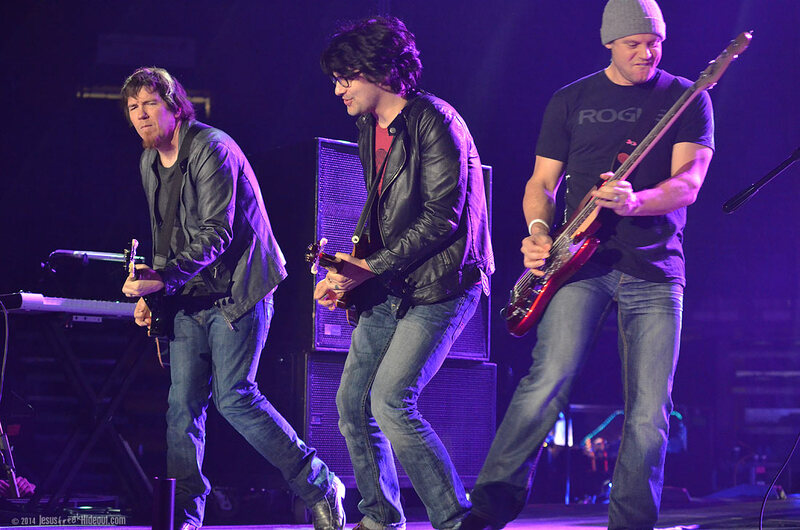 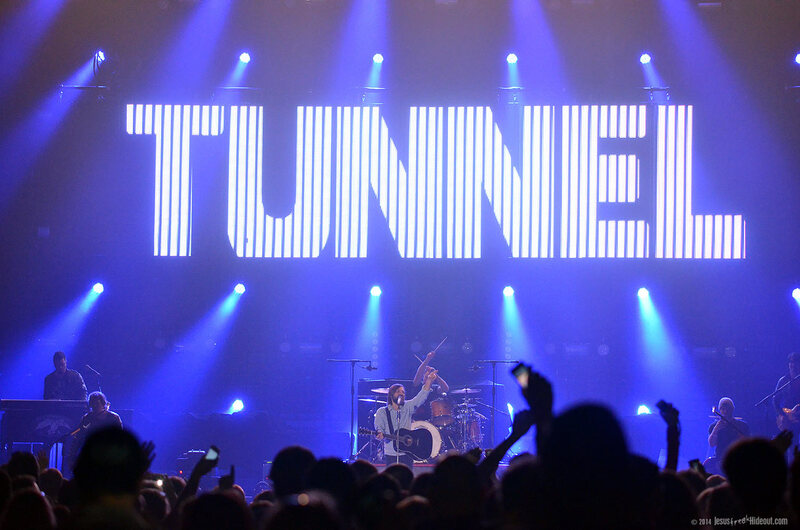 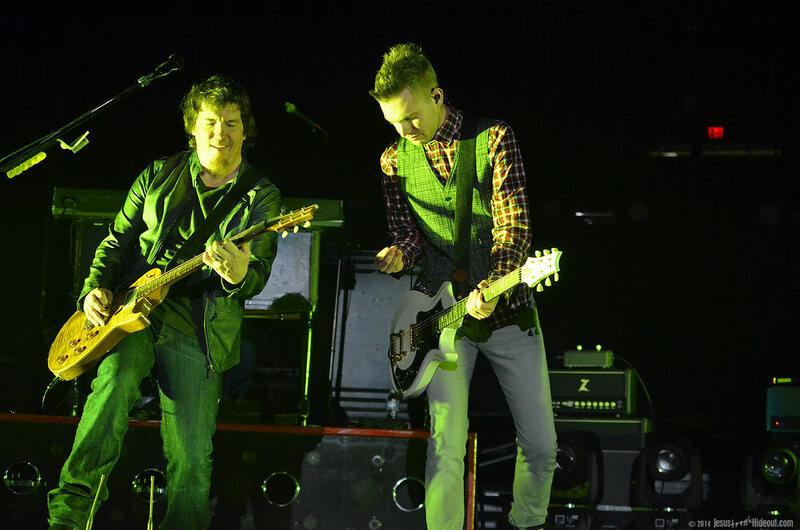 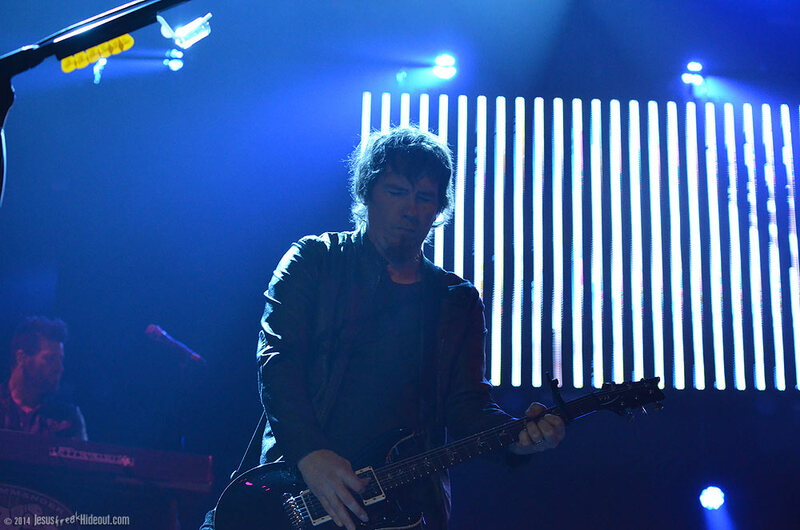 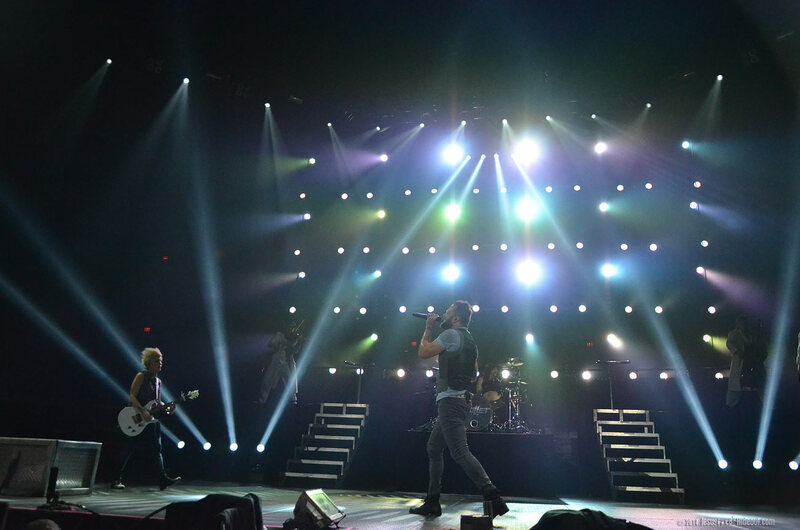 Their fun single "Kicking and Screaming" from Miracle followed and then they amped up the rock with Wherever You Are's "Tunnel" (a song that has always played better live than in recorded form), where they invited fans to hold their cell phones up for "lights" ('at the end of this tunnel'), and then the encouraging ballad "Revelation." 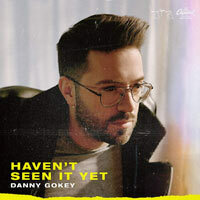 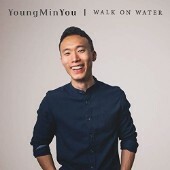 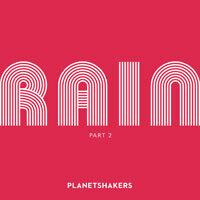 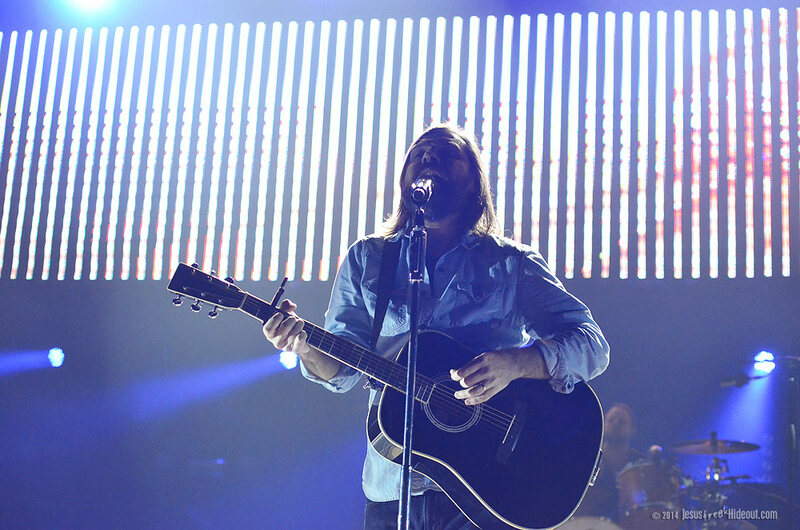 The hit single from their latest record, Miracle, "I Need A Miracle," featured a unique video as its backdrop, about a father planning to end his life, and then the mood punched up again for the fun and funky "Make Your Move" from Move. 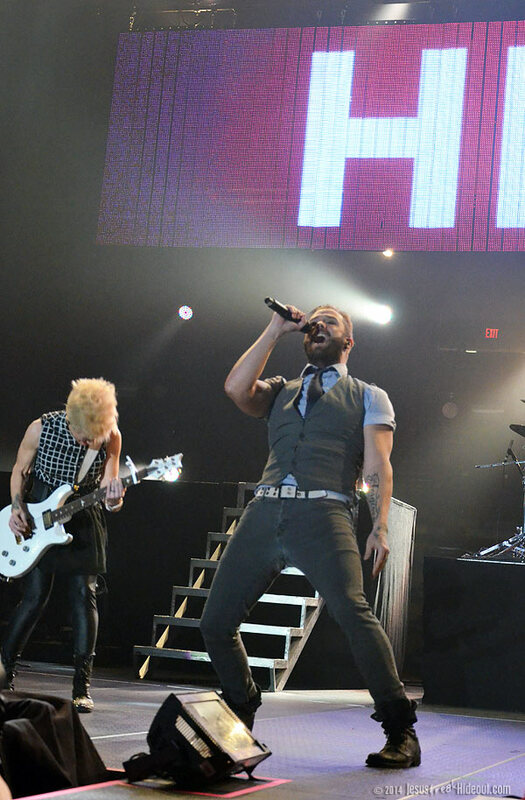 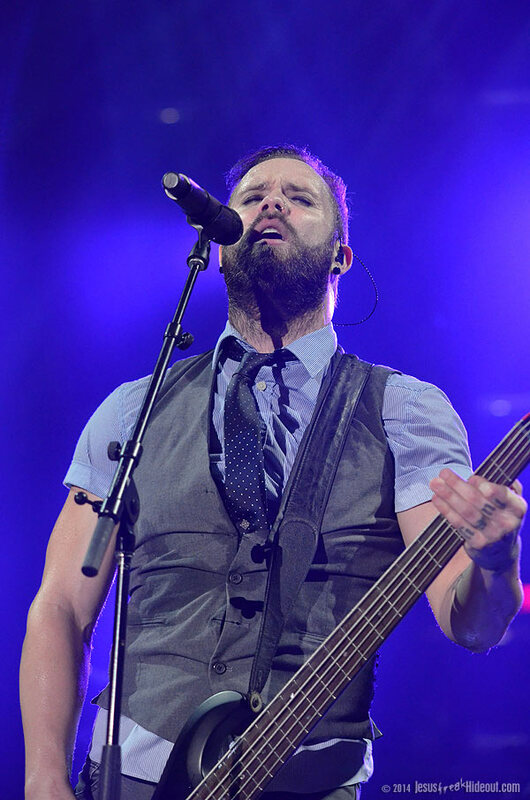 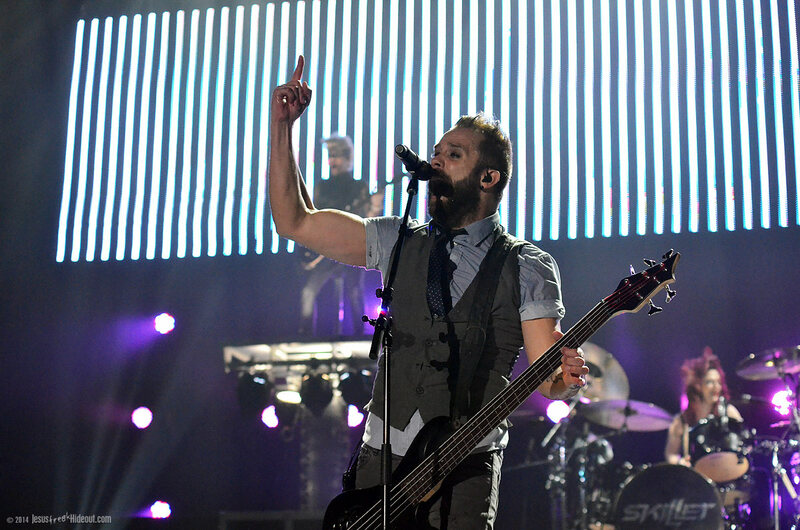 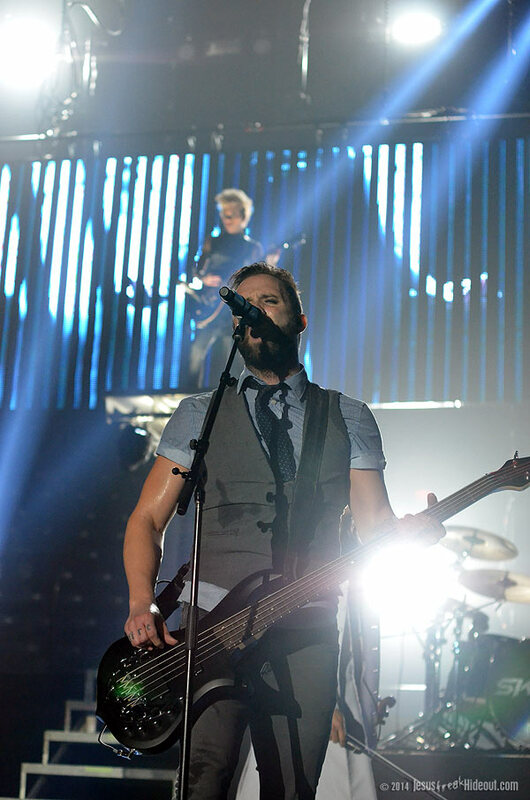 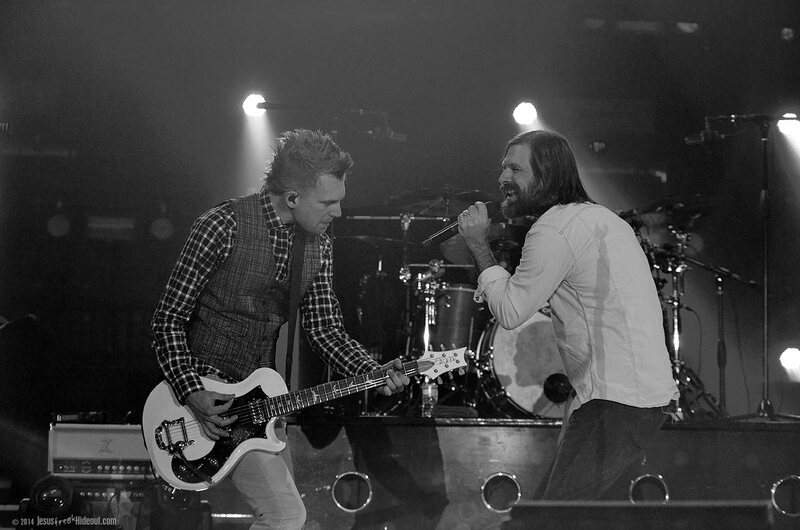 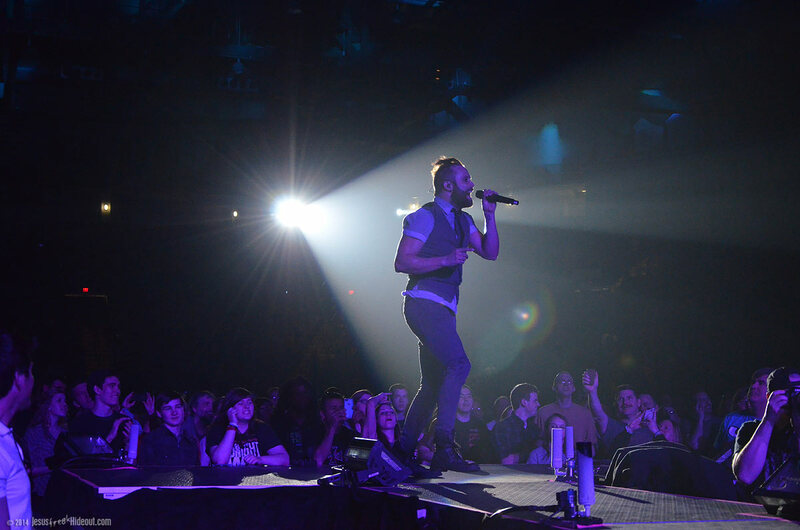 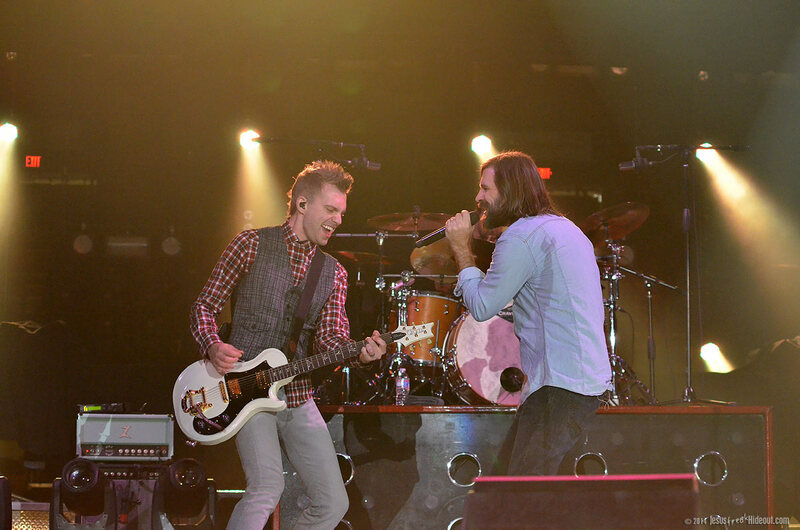 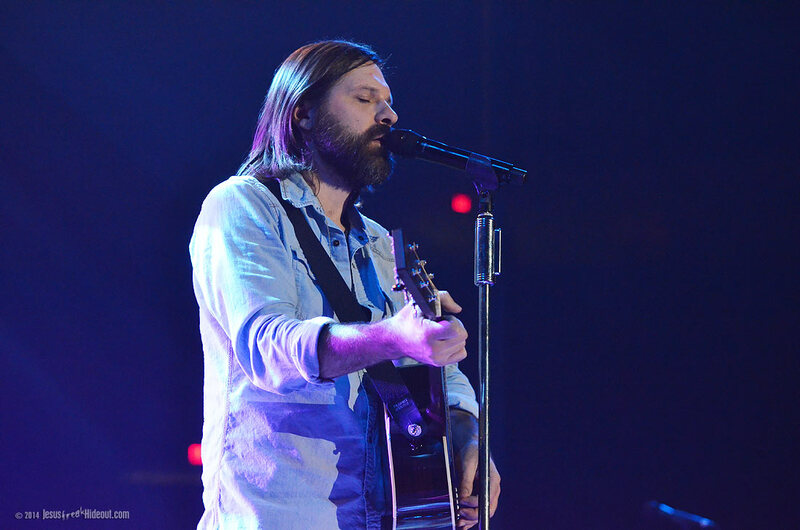 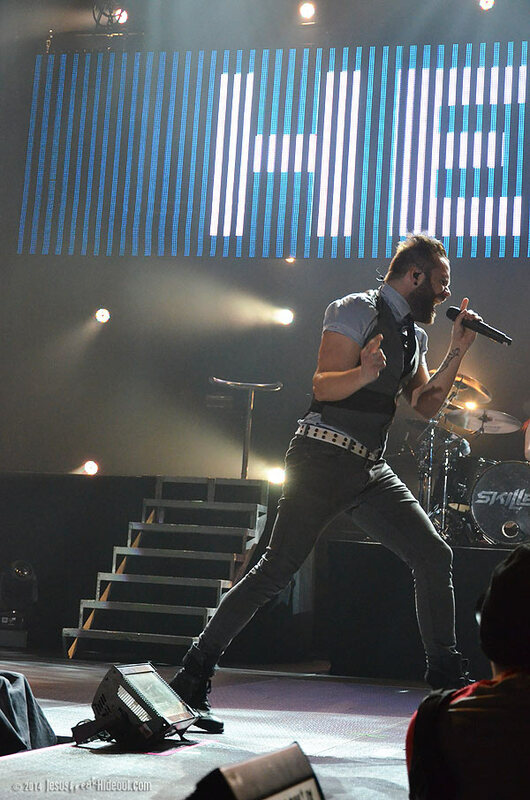 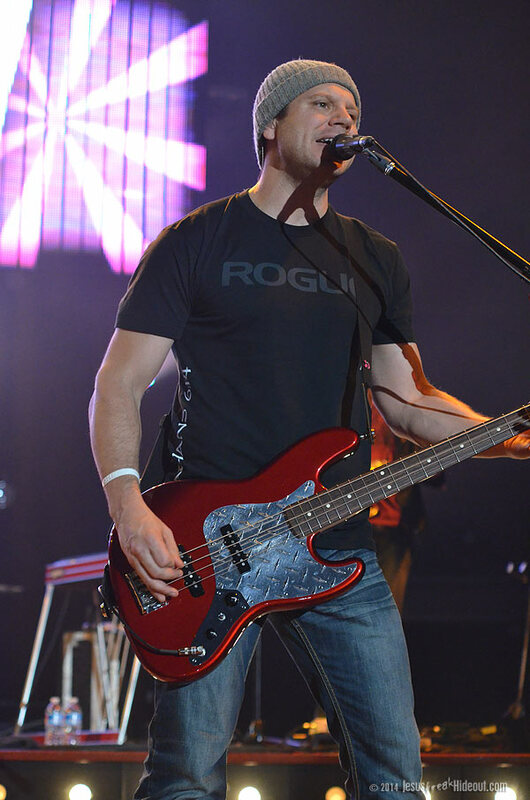 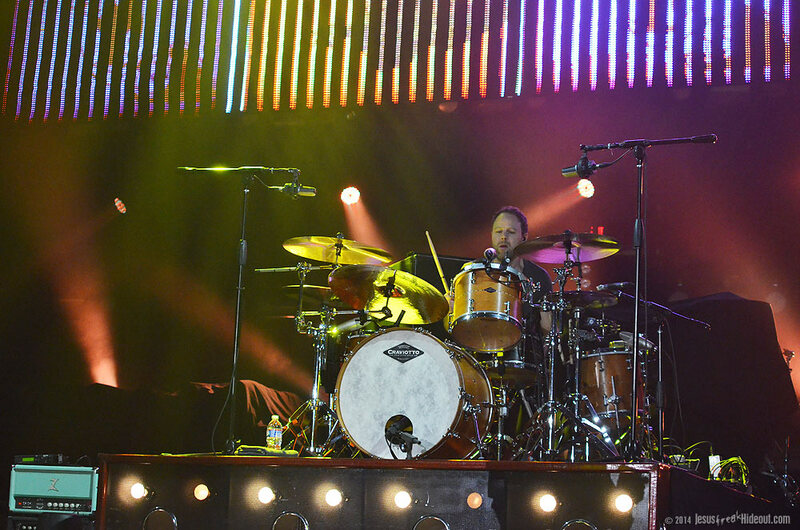 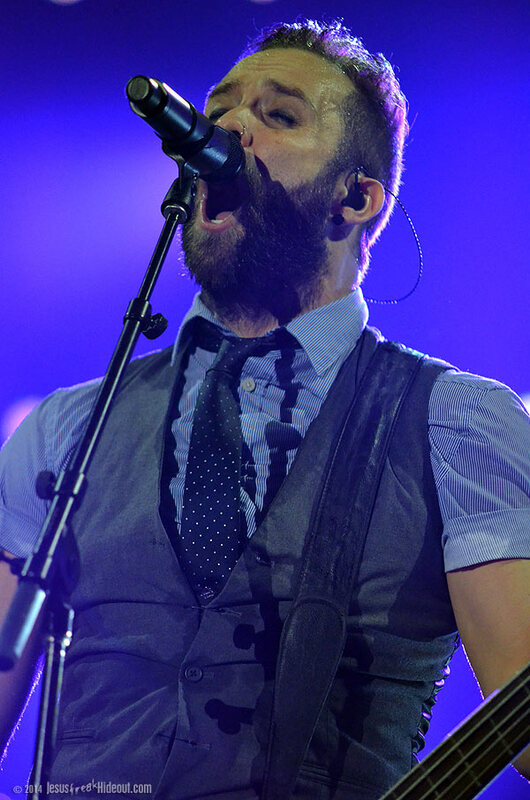 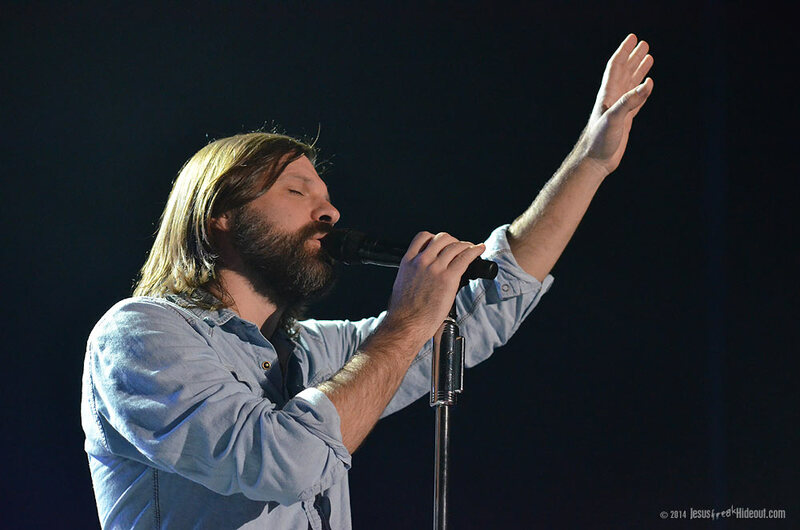 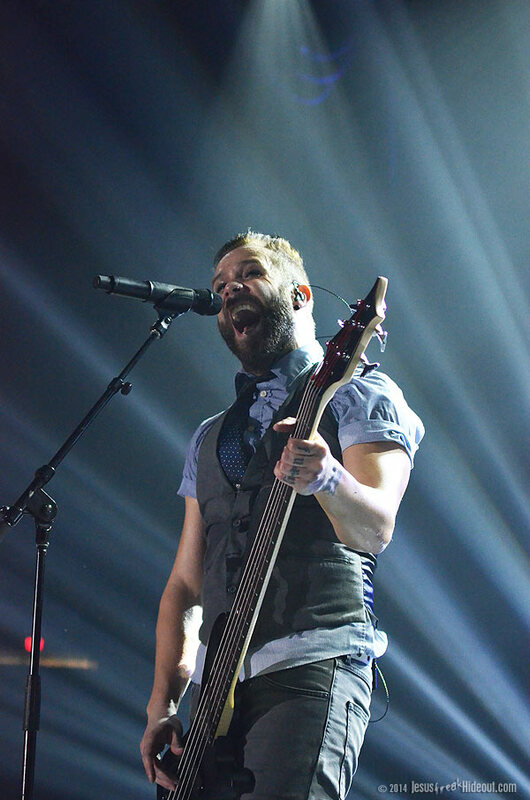 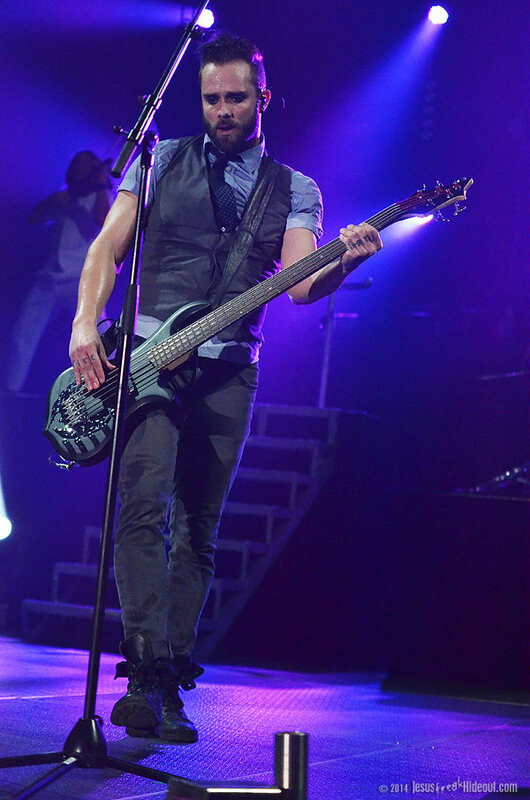 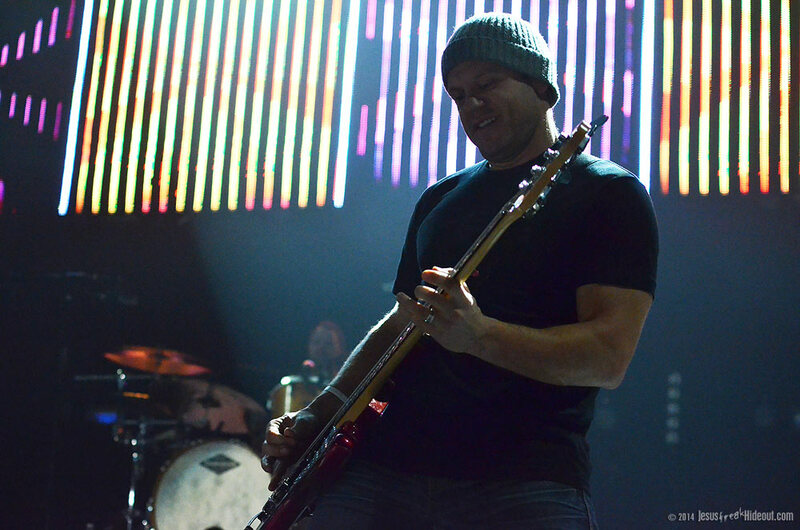 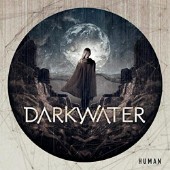 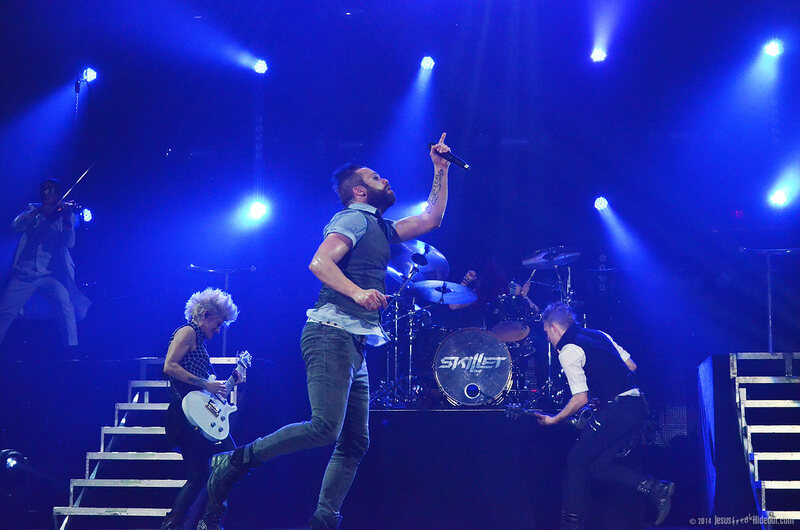 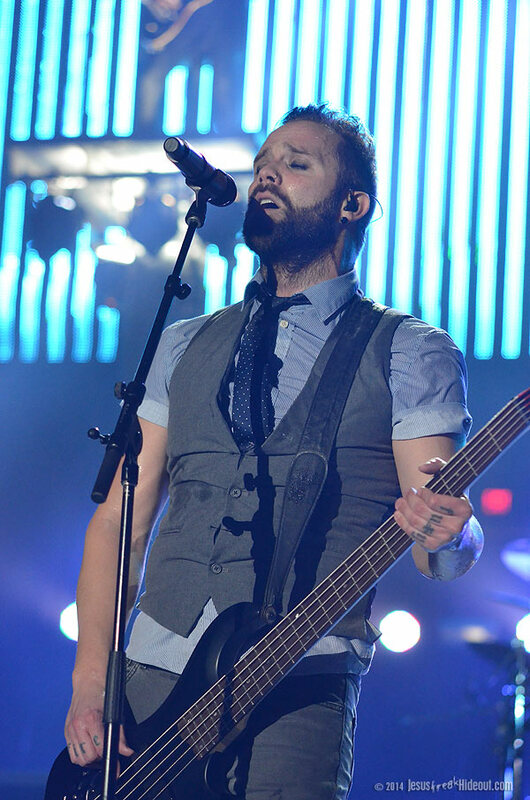 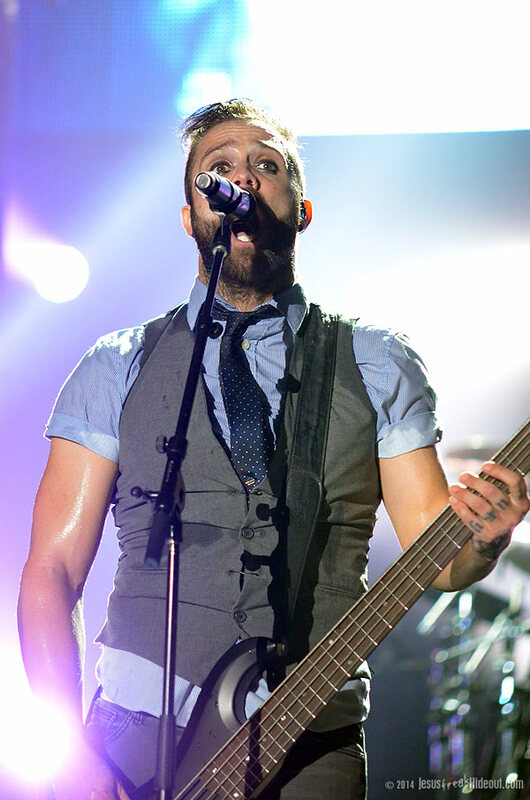 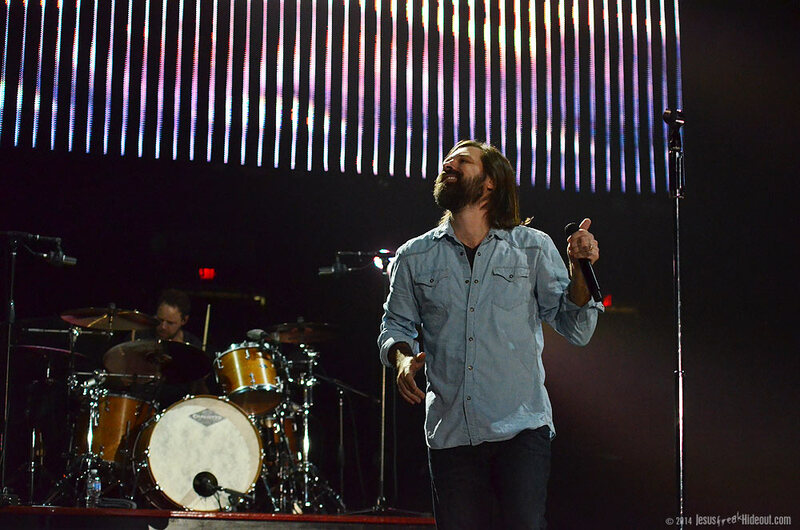 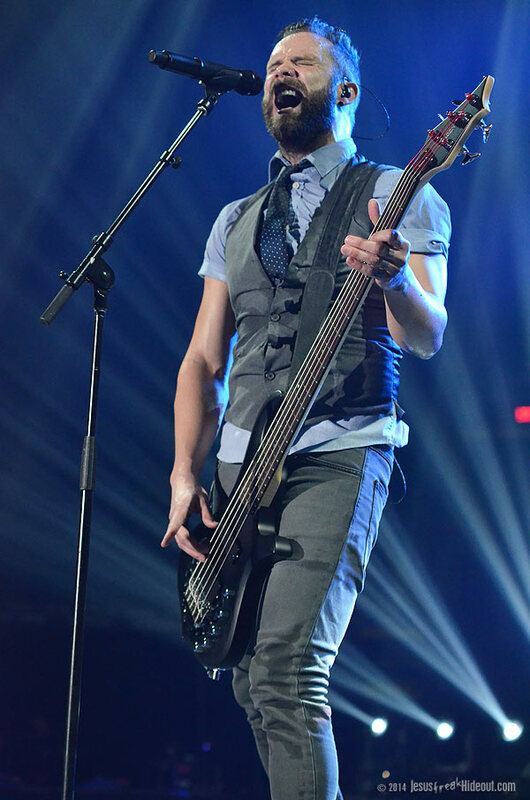 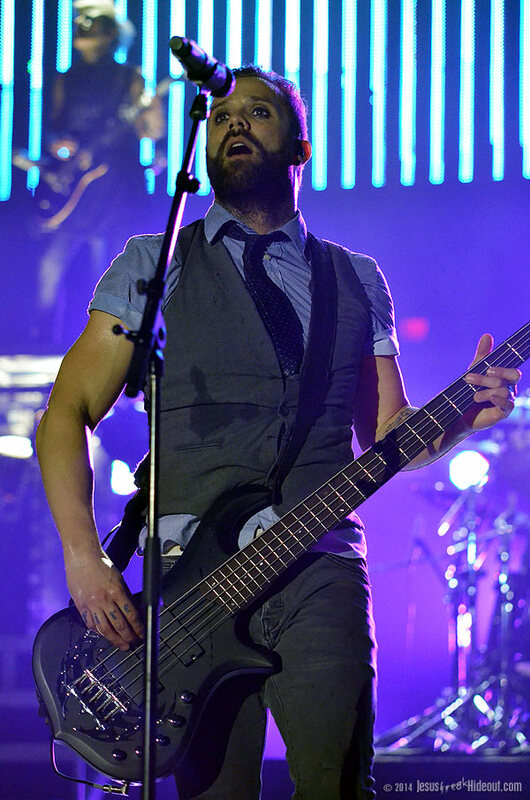 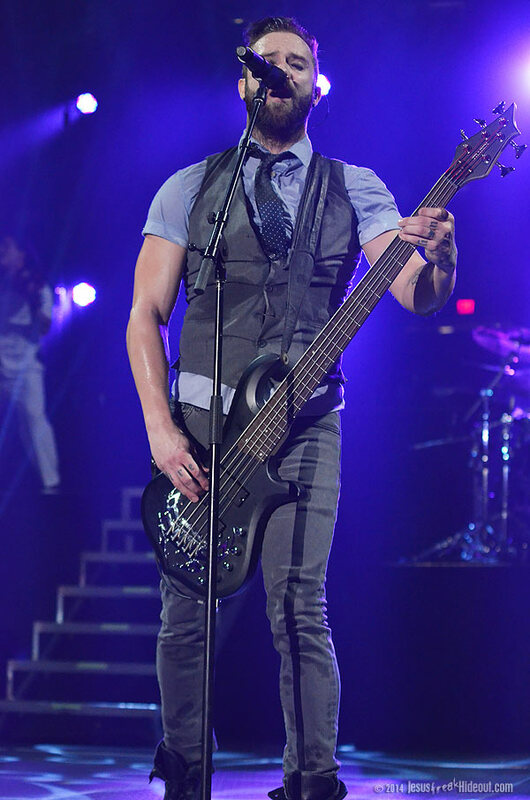 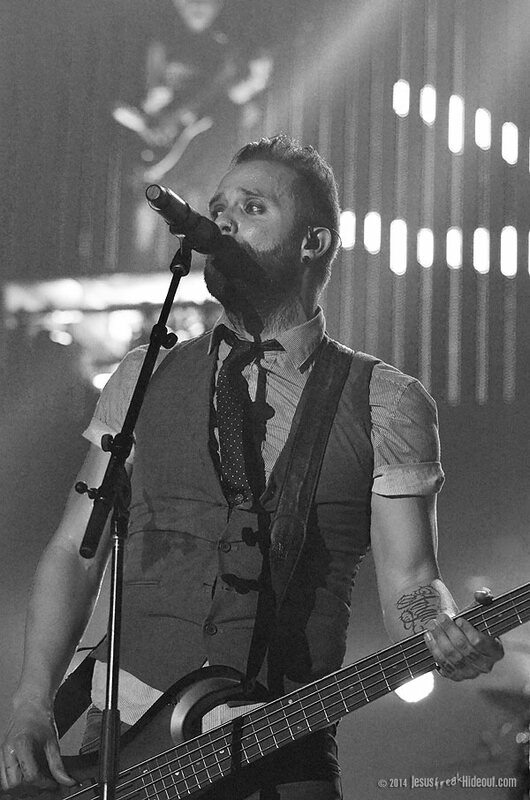 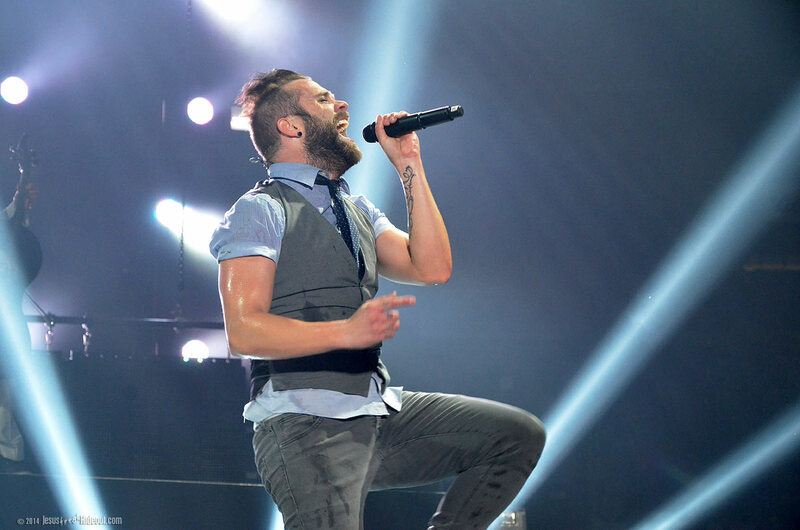 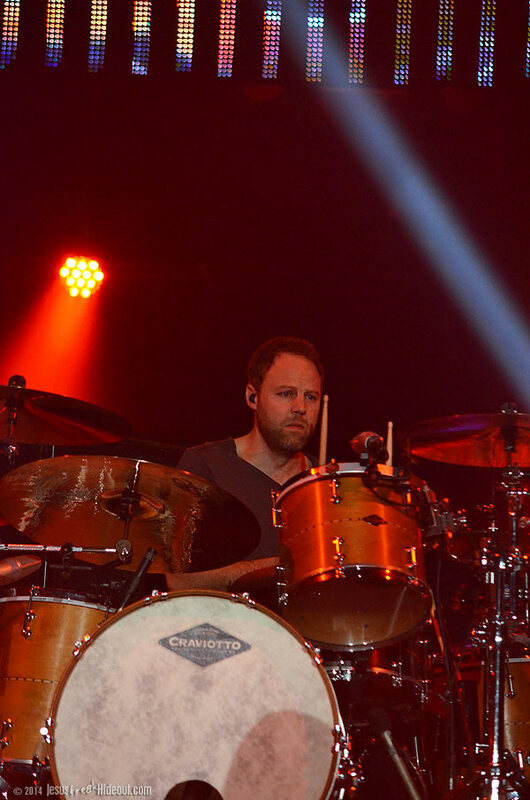 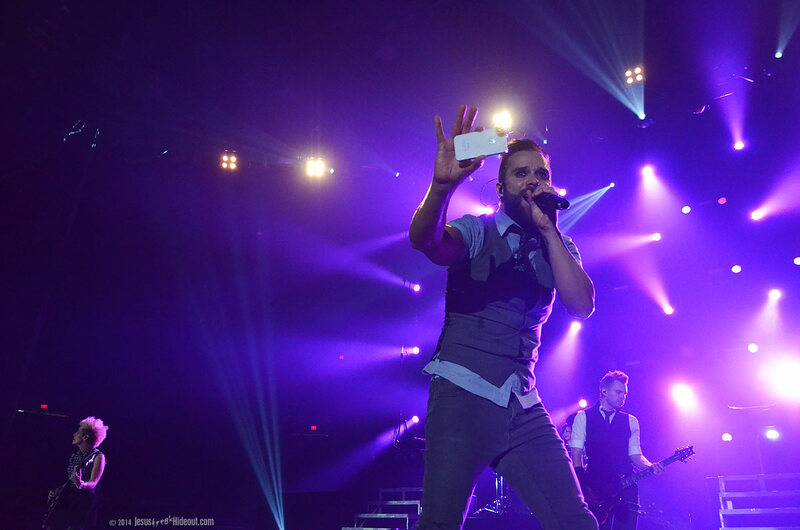 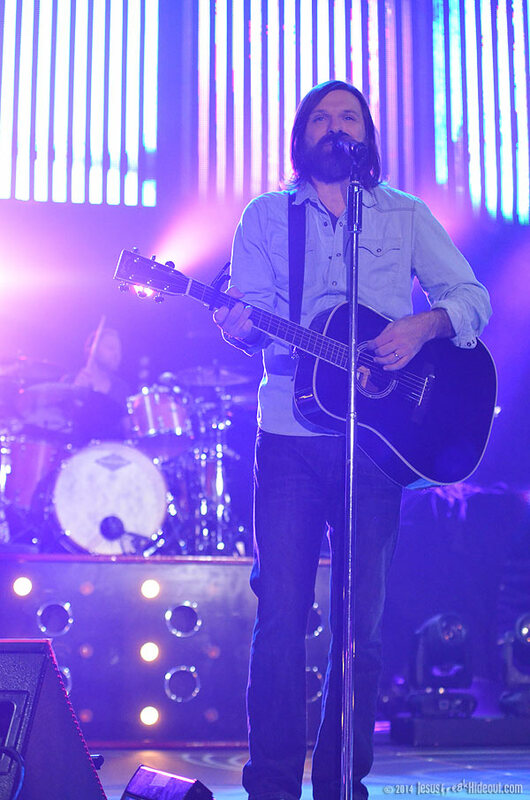 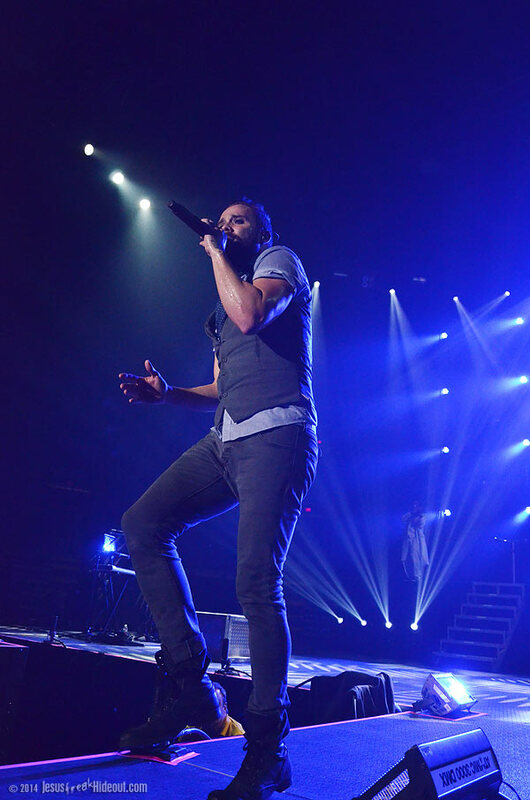 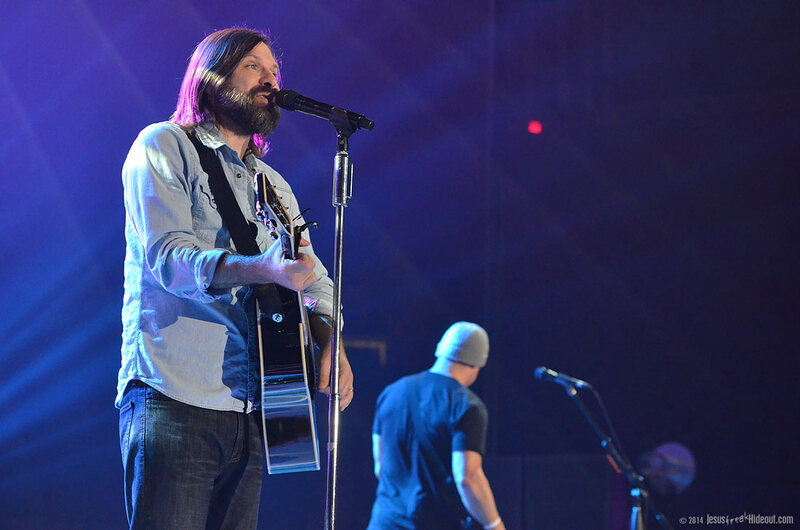 Afterwards, vocalist Mac Powell announced the performance of a special older song added to the set list and invited Skillet's Seth Morrison on stage to perform additional guitar on "Took My Place," from their 1999 album, Time. 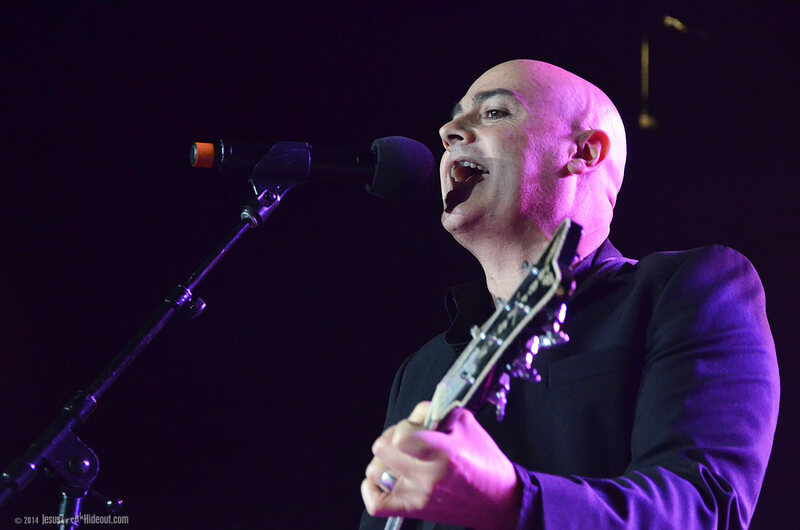 Powell then lead the audience in a chorus of the renowned hymn "Blessed Assurance" before blending it into "Cry Out To Jesus." 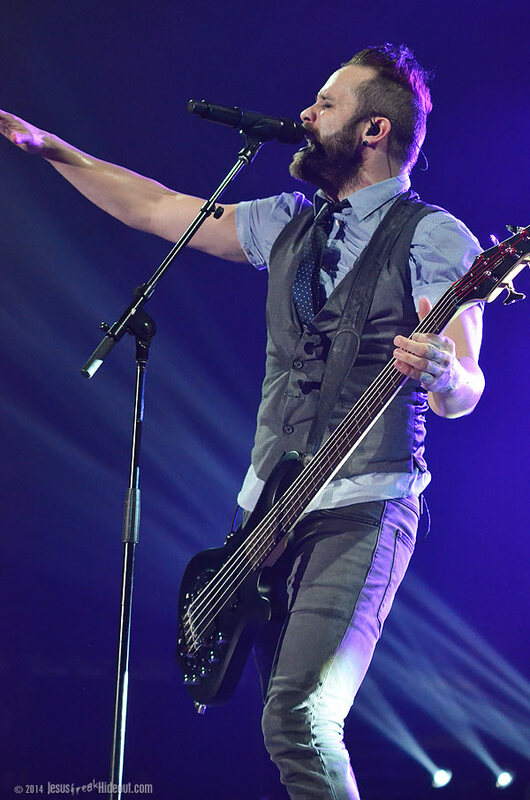 The anthemic "Children of God" was an appropriate follow-up, and Powell quoted a passage from 1 John 3. 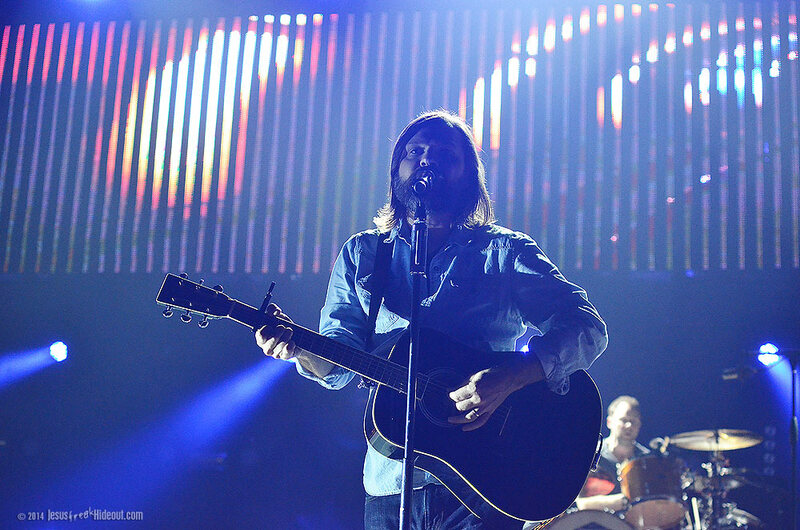 The City On A Hill classic worship song "God of Wonders" was a nice addition, and then the guys teased a chorus of "Come Together" before segueing it into "I Got A Feeling." 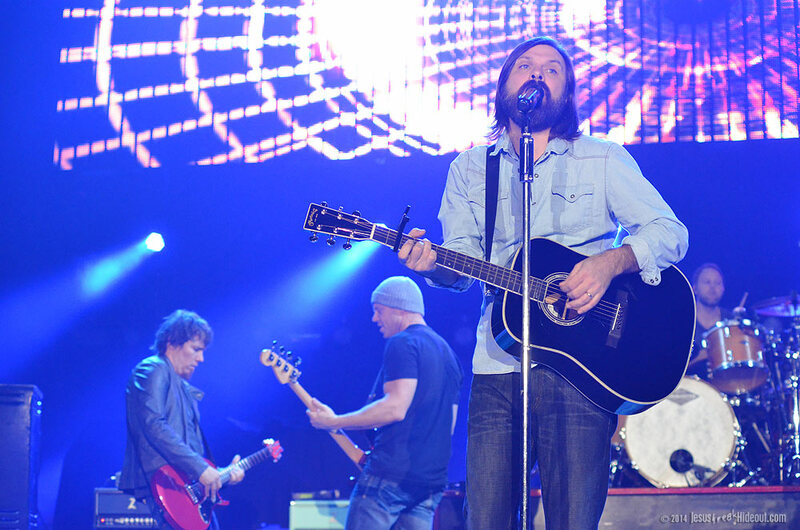 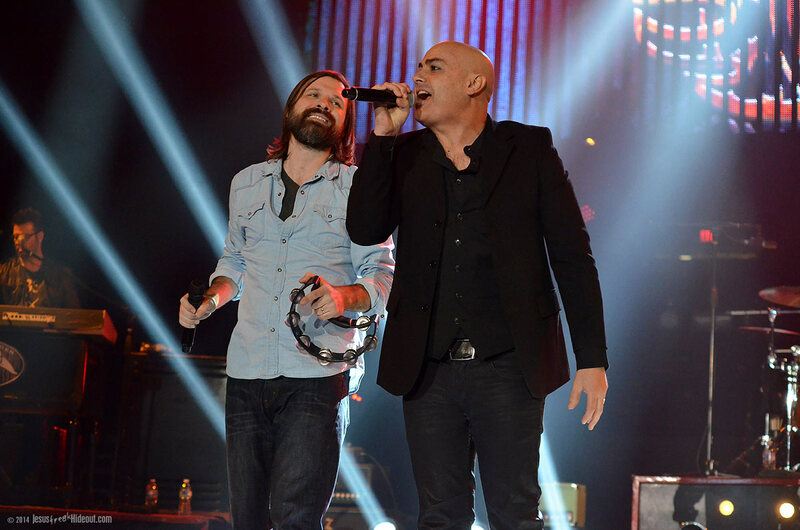 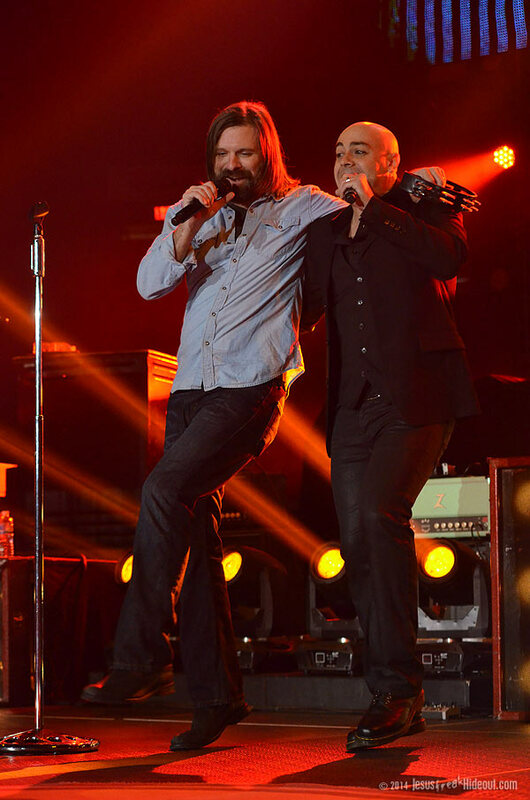 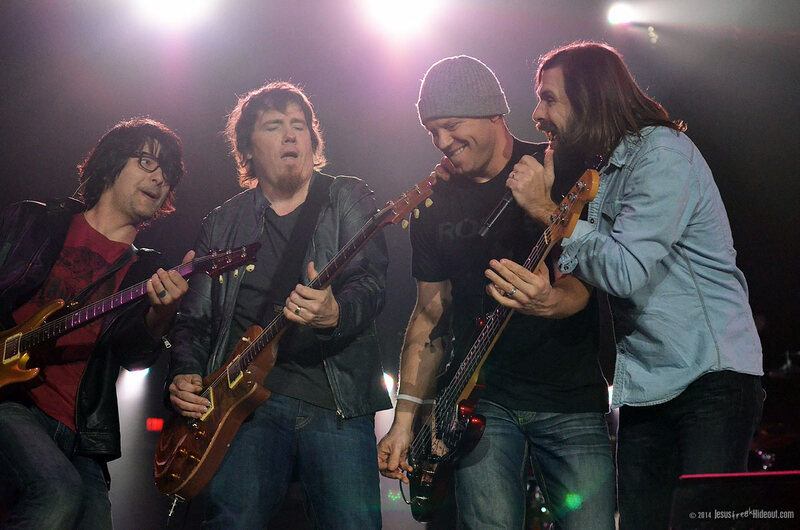 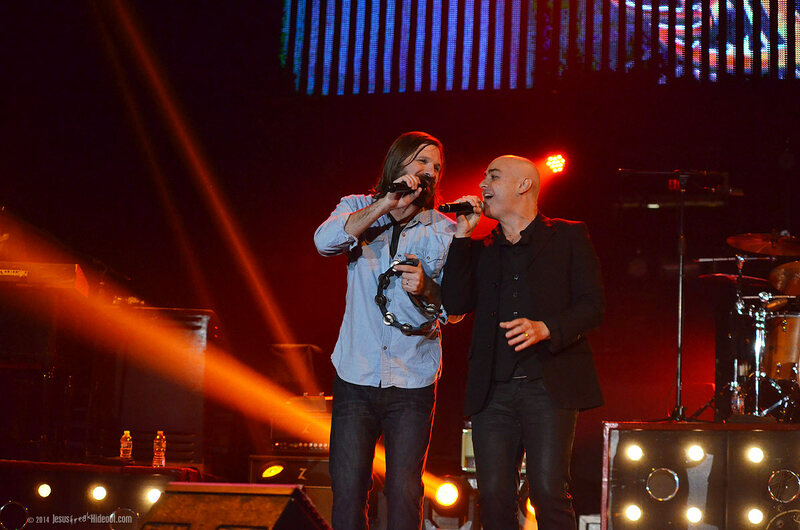 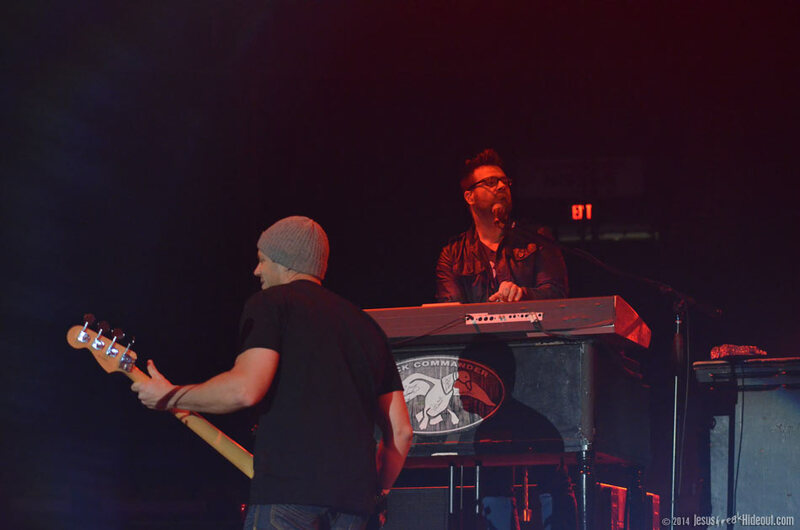 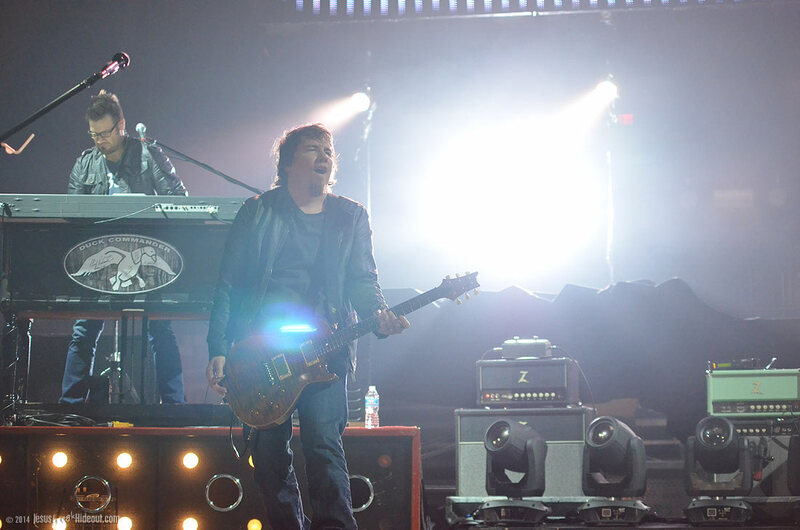 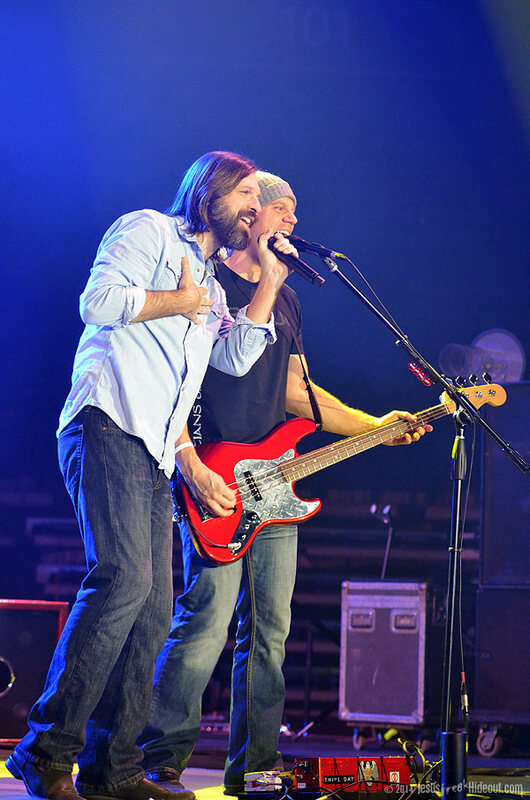 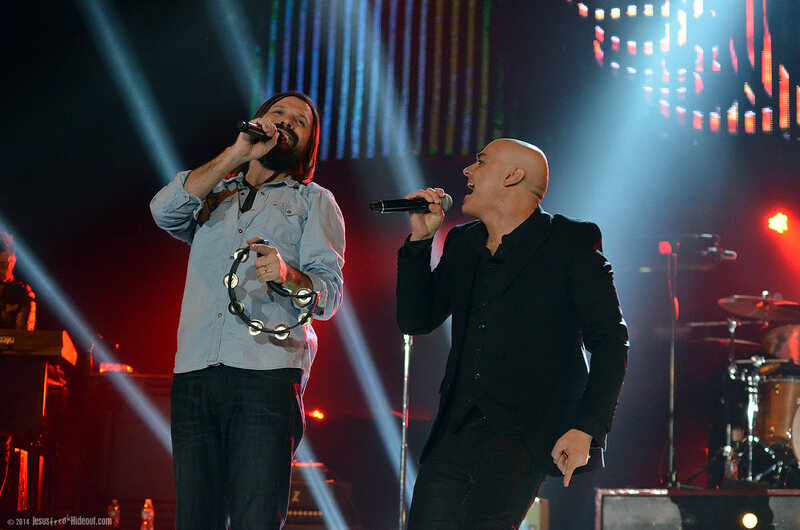 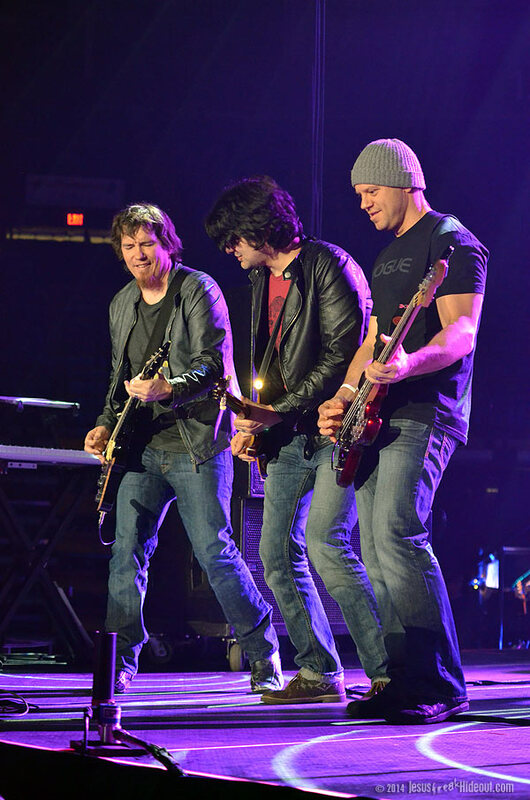 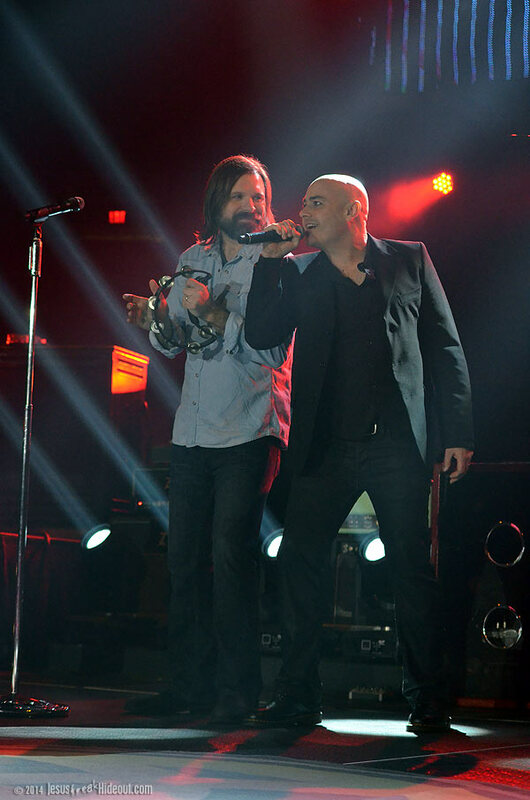 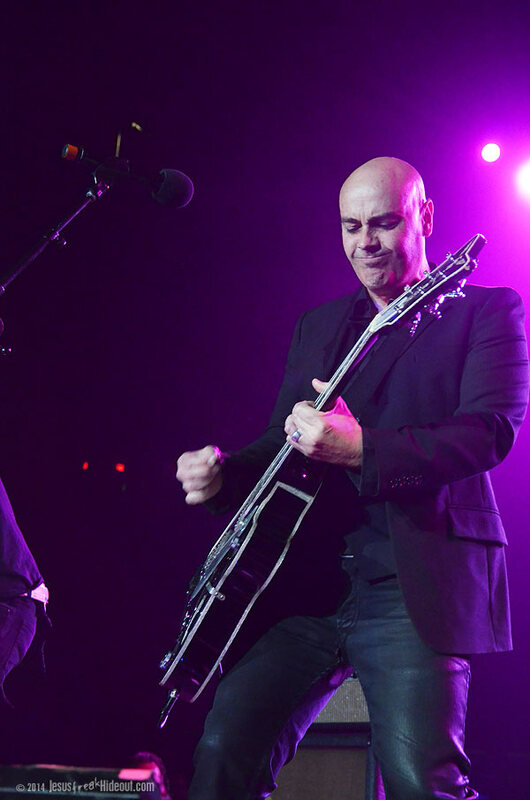 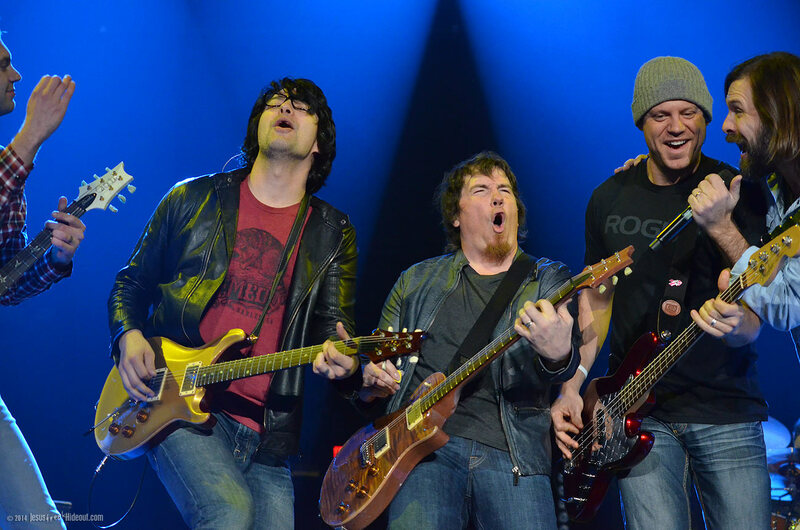 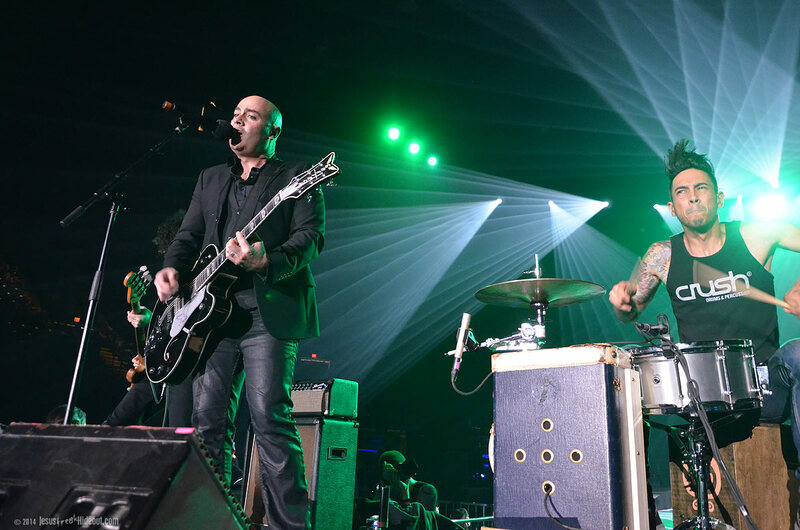 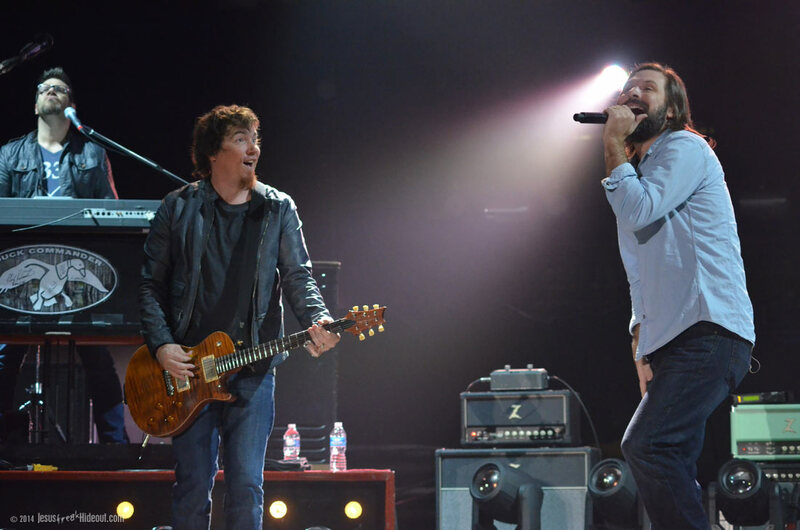 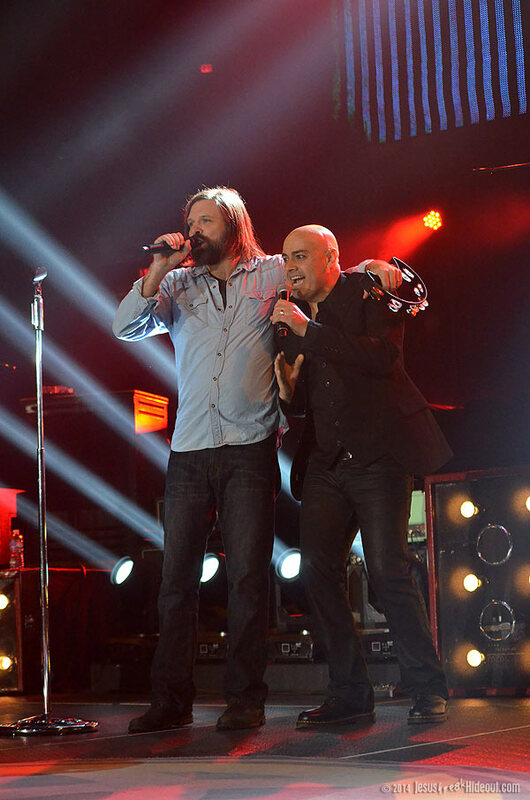 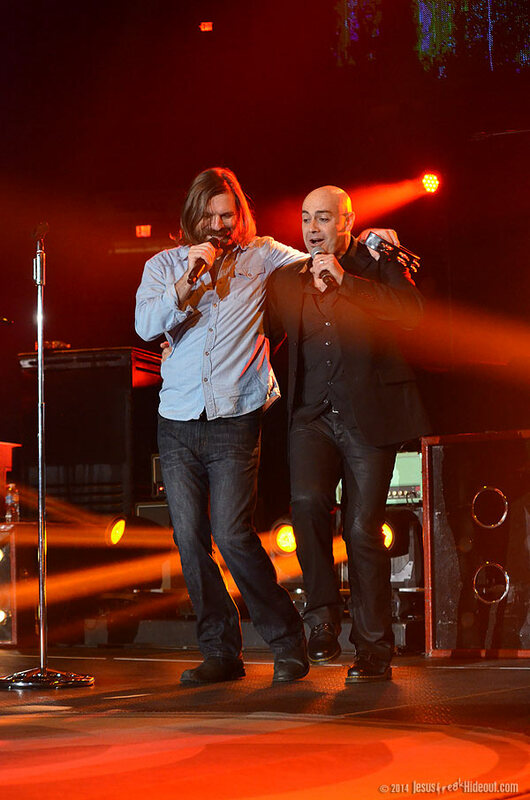 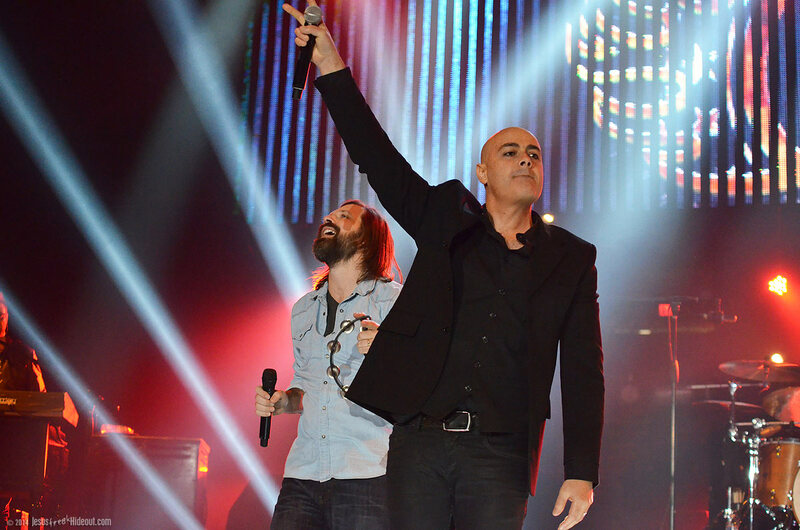 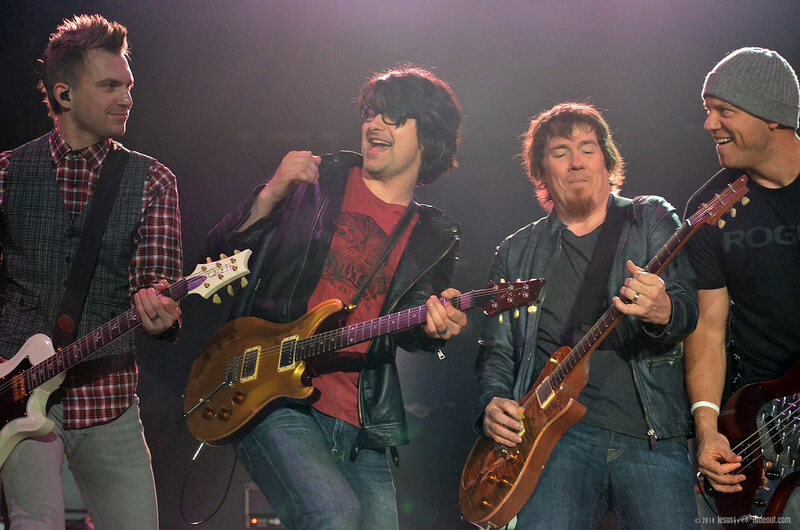 To transition beautifully into the next set, Third Day invited Peter Furler on stage with them and Furler and Powell traded vocals on "I Am Free," a song made popular by the Newsboys on their GO album, before Third Day left the stage and the rest of Peter's band joined him. 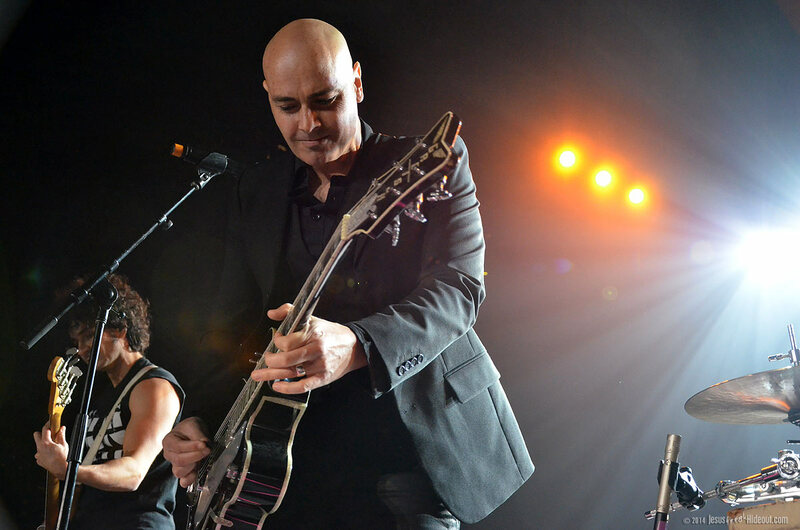 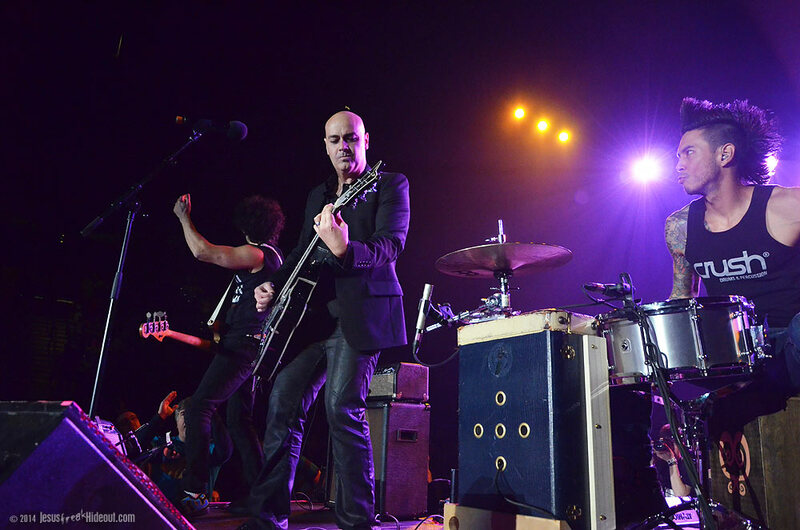 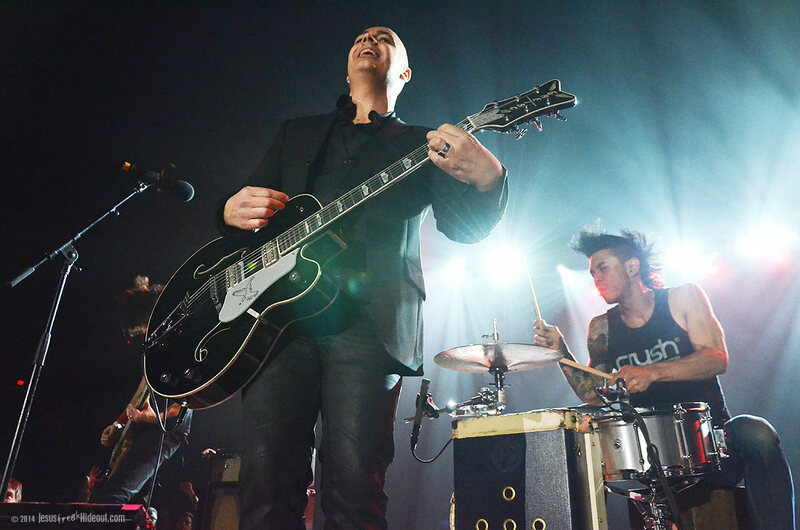 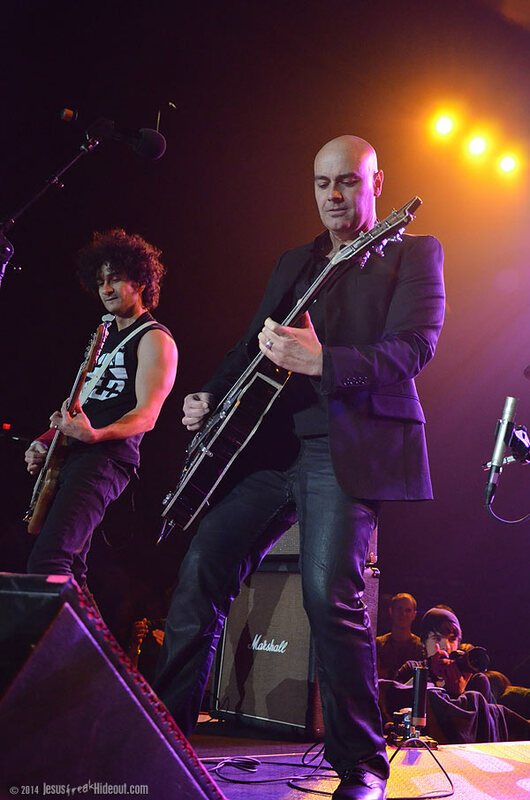 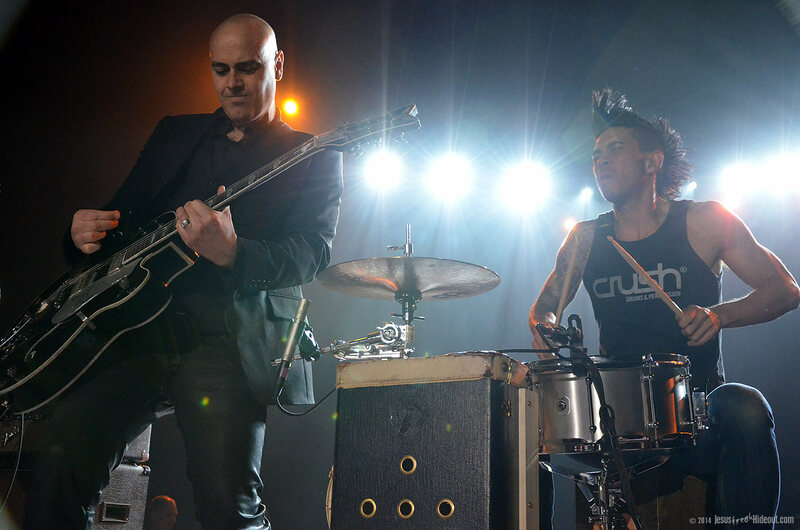 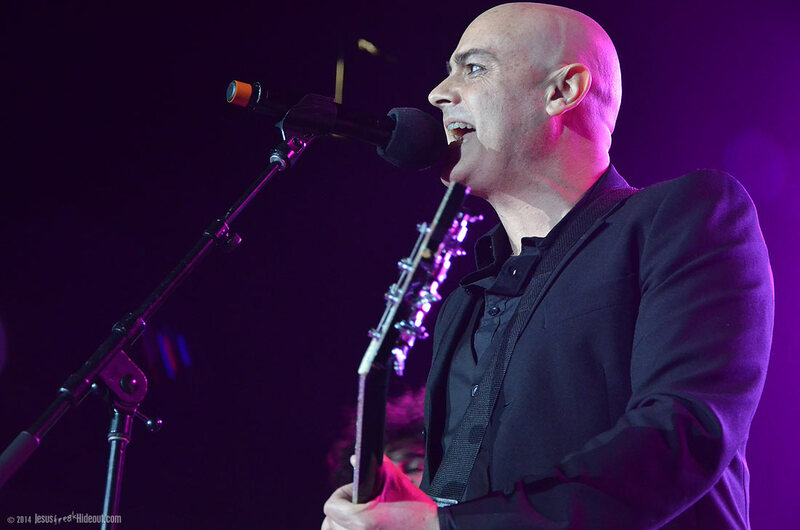 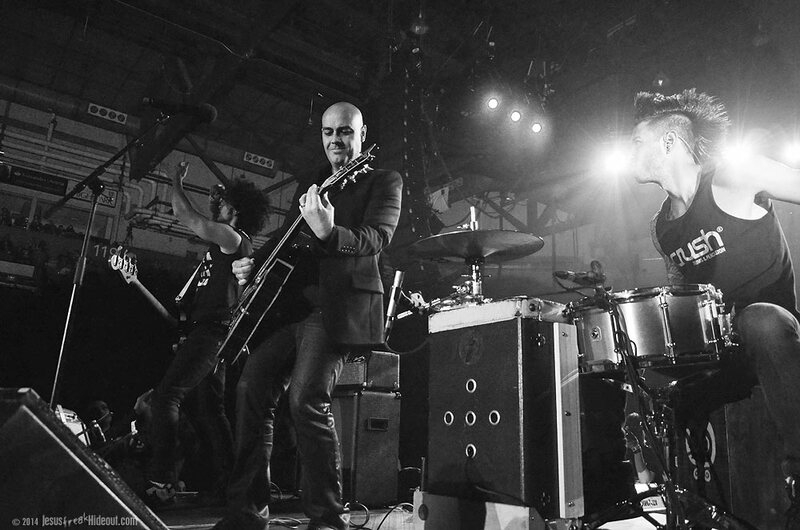 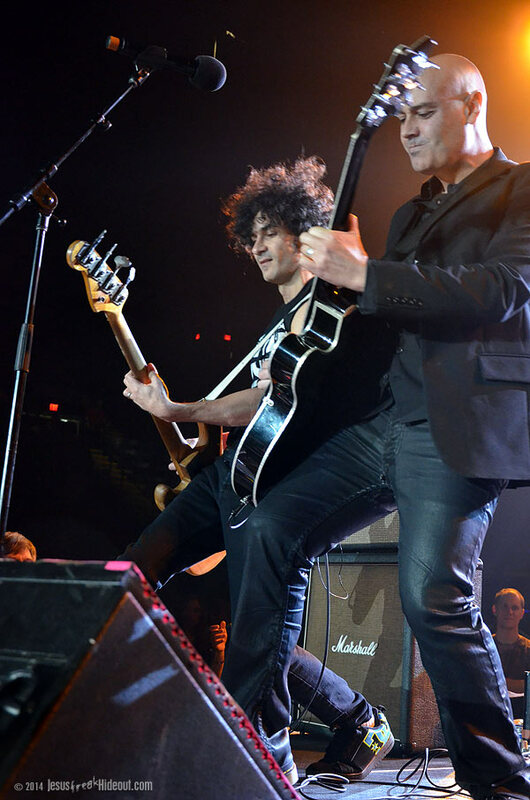 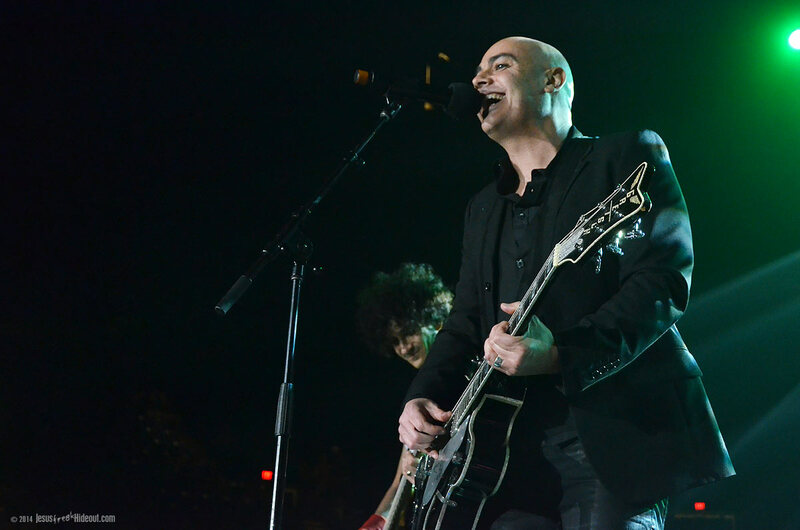 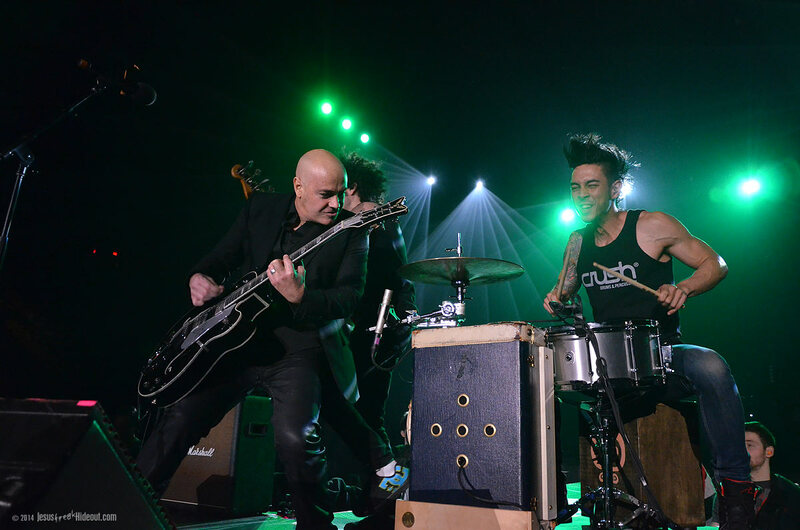 The newly formed Peter Furler Band were a welcomed addition to the night. 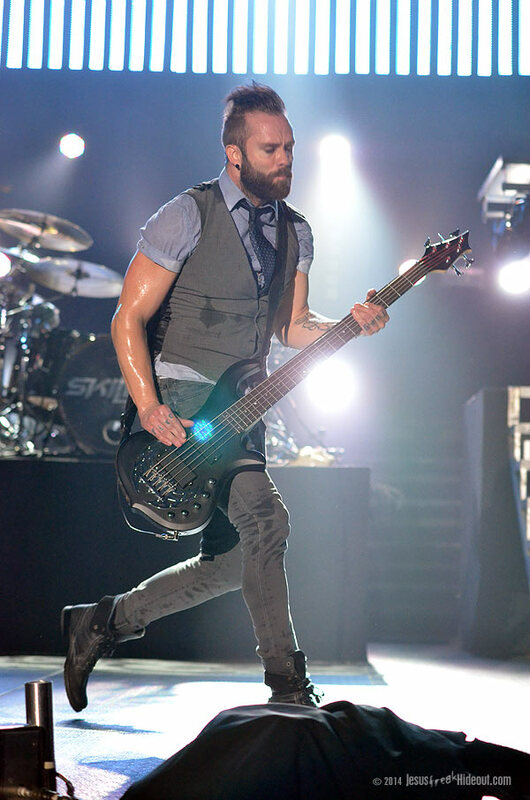 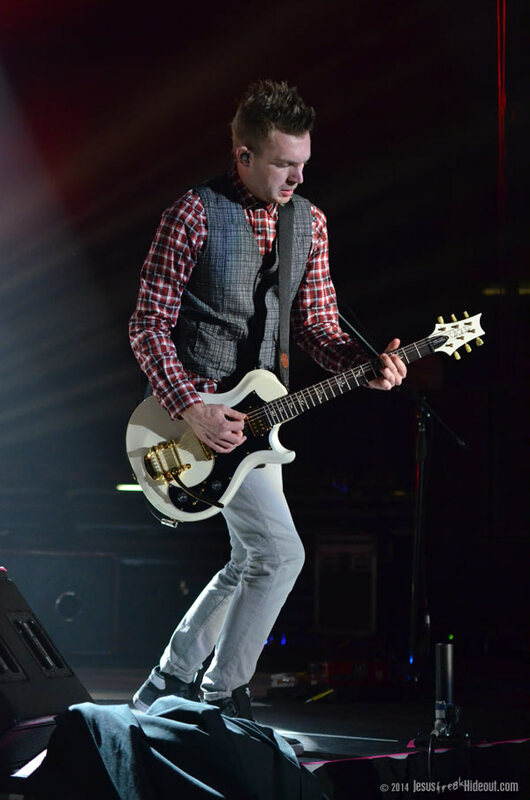 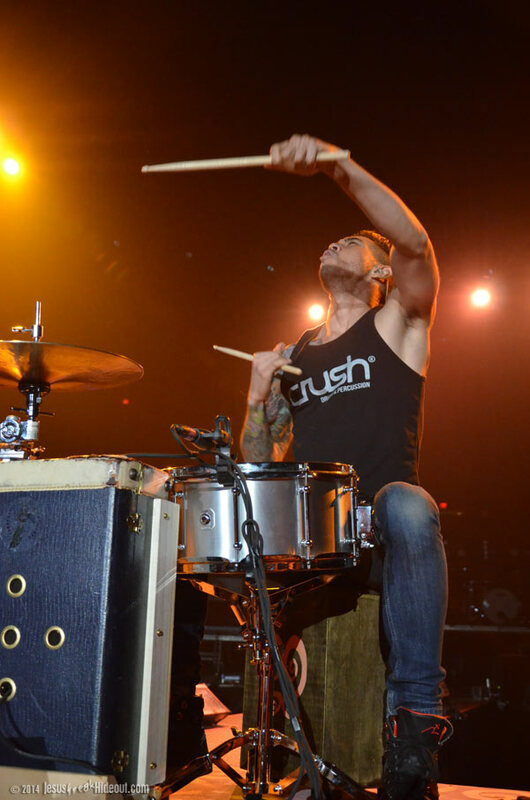 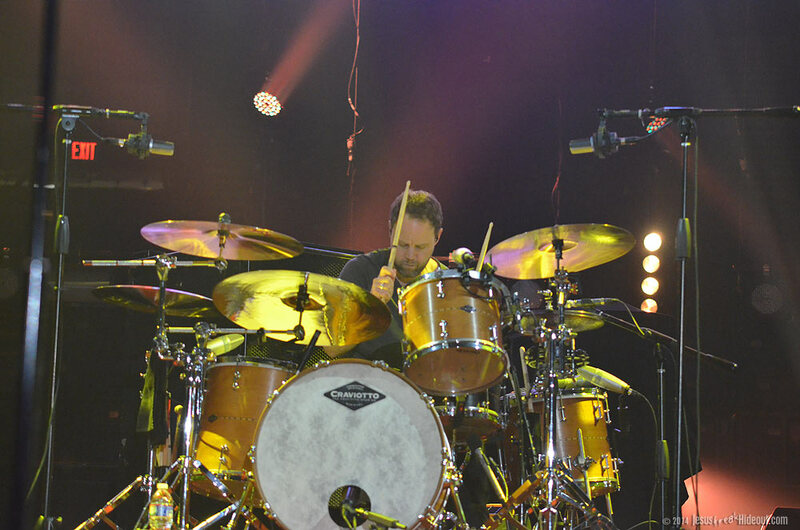 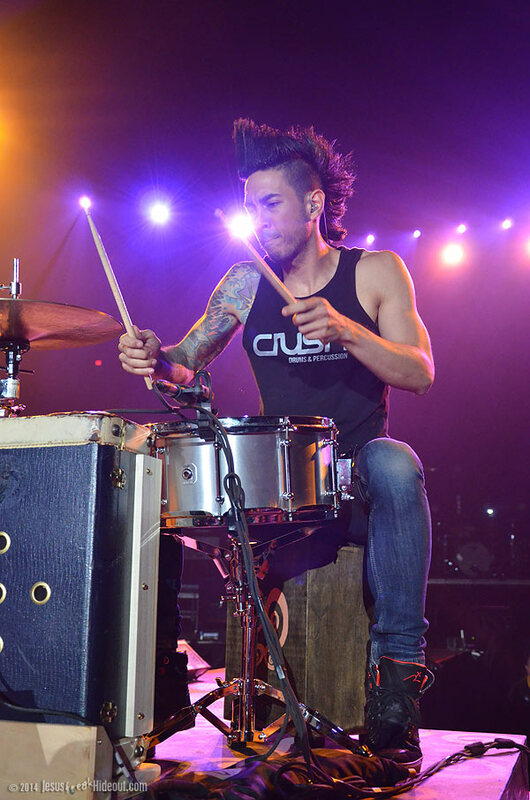 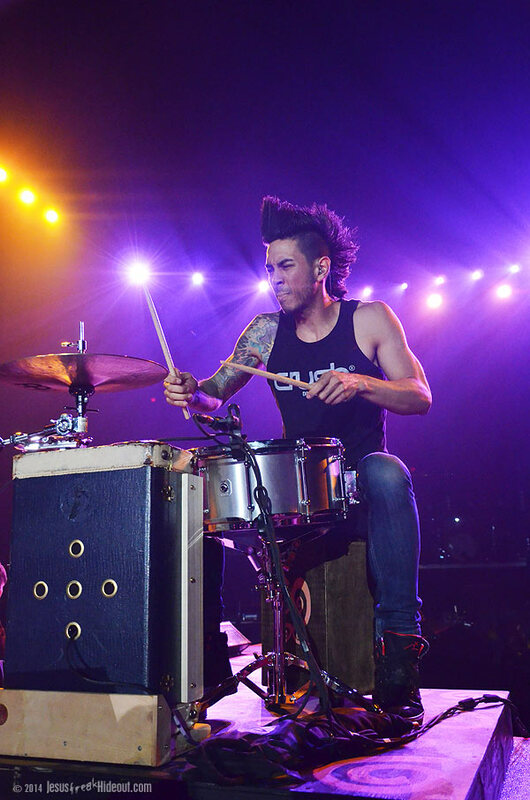 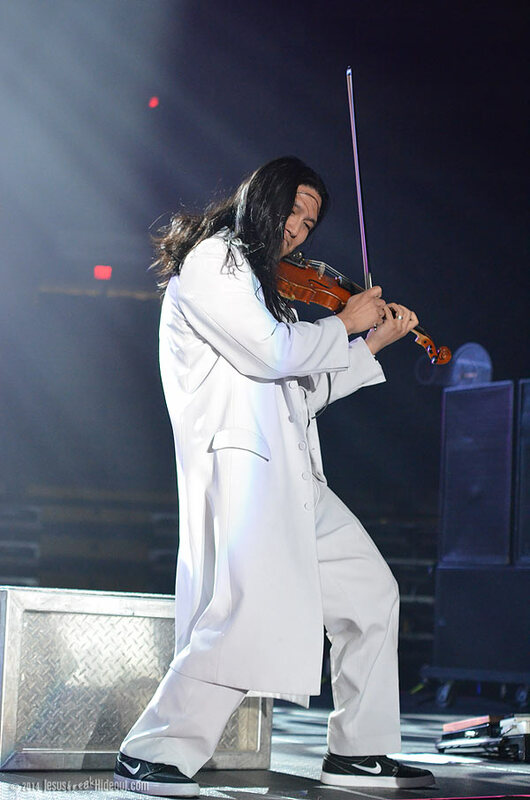 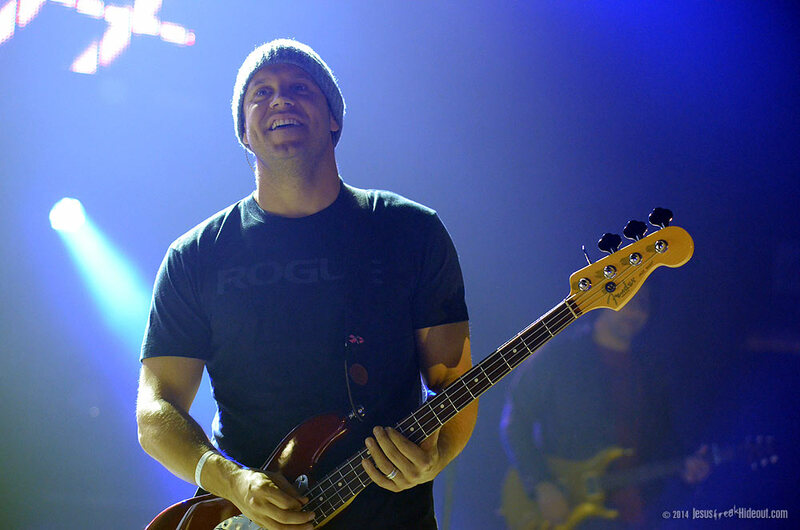 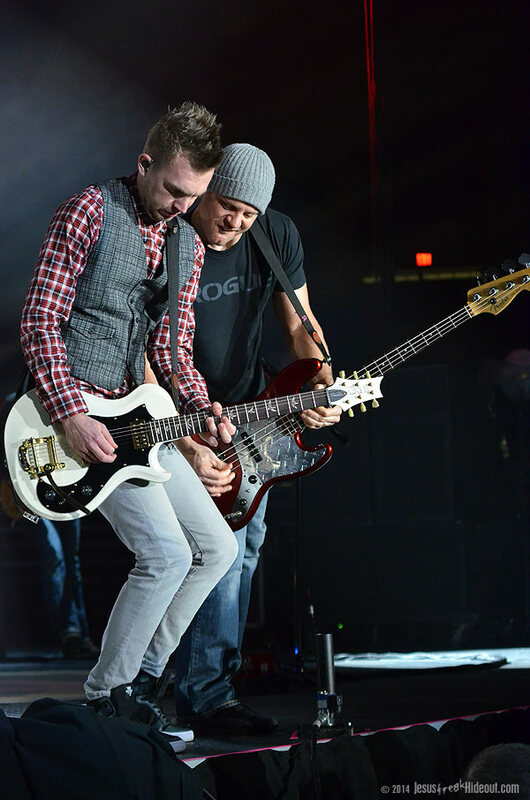 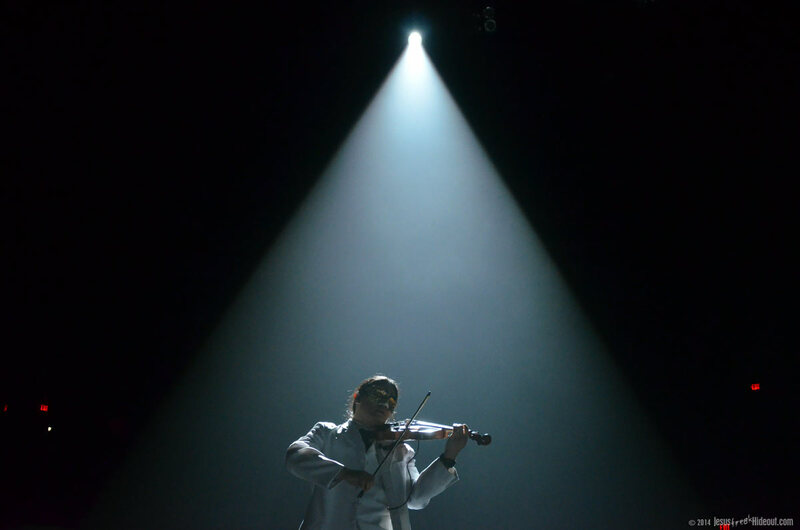 Peter had left the Newsboys mostly due to burnout and recent years of taking it easy and getting back to the basics with music-making had inspired him to form a new band. 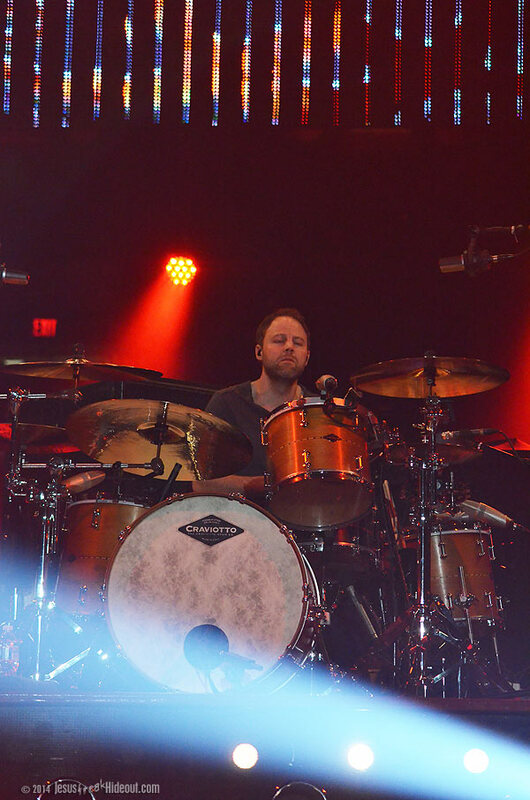 And to make it even more of a change for Furler, he set up his band at the end of the catwalk for a simple drums, bass, and guitar presentation for his short set. 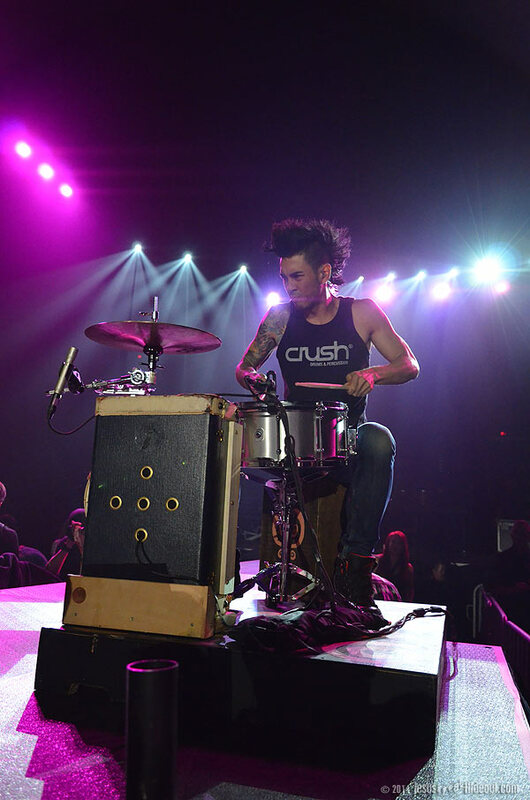 Drummer Jeff Irizarry just used a snare and a suitcase converted into a kick drum and the set just felt all the more intimate and unique. 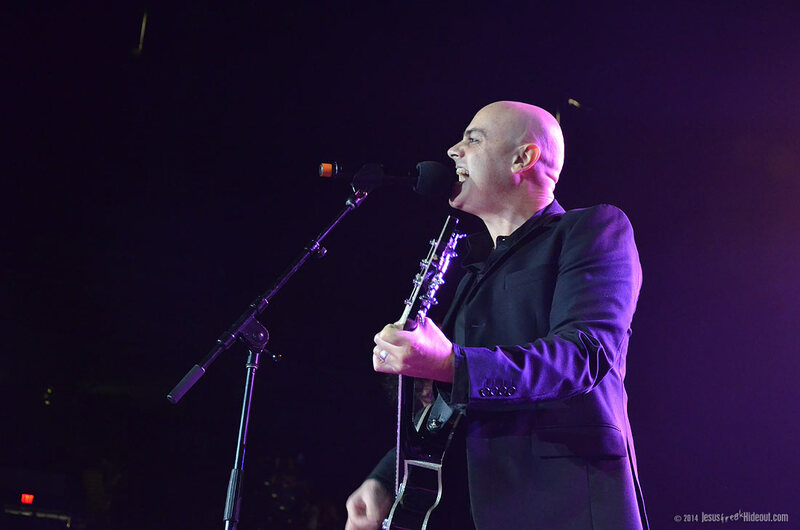 The trio opened with "Something Beautiful" from Newsboys' GO and then Peter reminisced about signing his first record deal in Allentown, PA before performing the title track from PFB's brand new record, Sun and Shield. 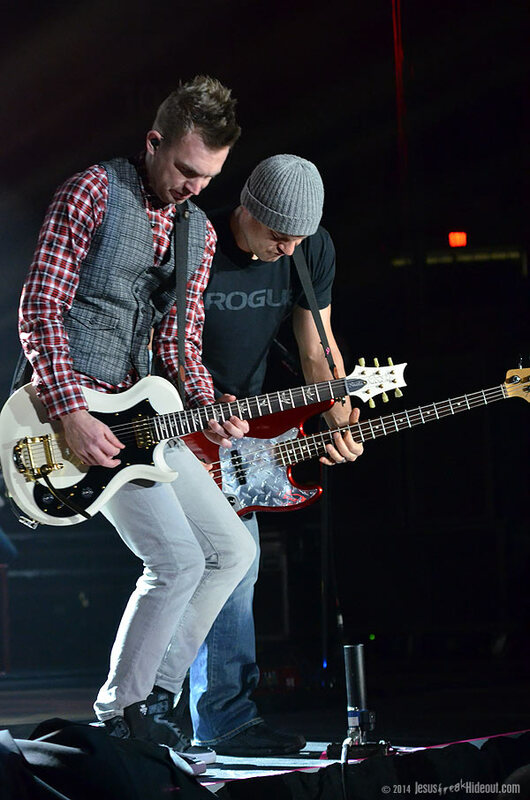 They then performed another new one, "So High," before Peter gave a classic scripture-based intro to "He Reigns" (like he used to do with his former band) and then performed the Newsboys worship song for the Reading, PA audience. 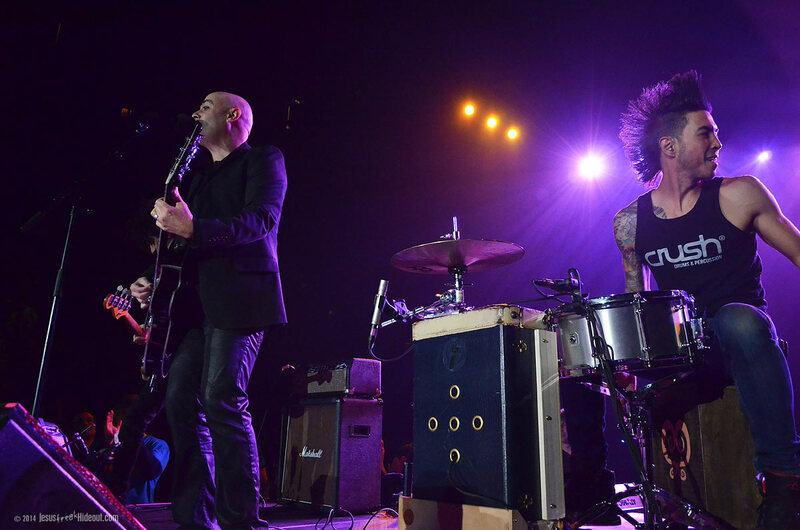 It was a strong set, but sadly a bit too much on the short side. 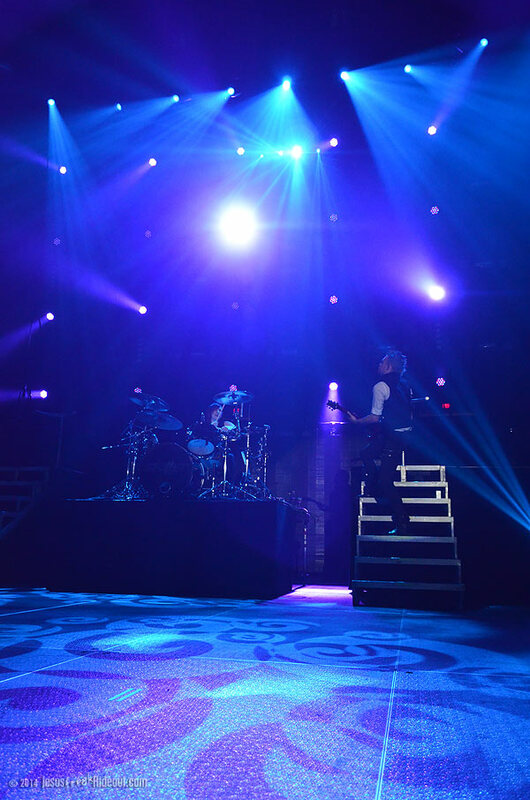 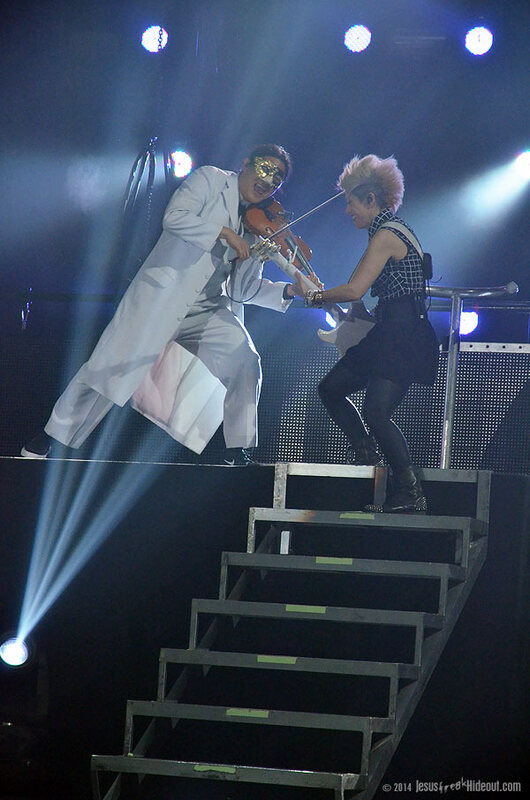 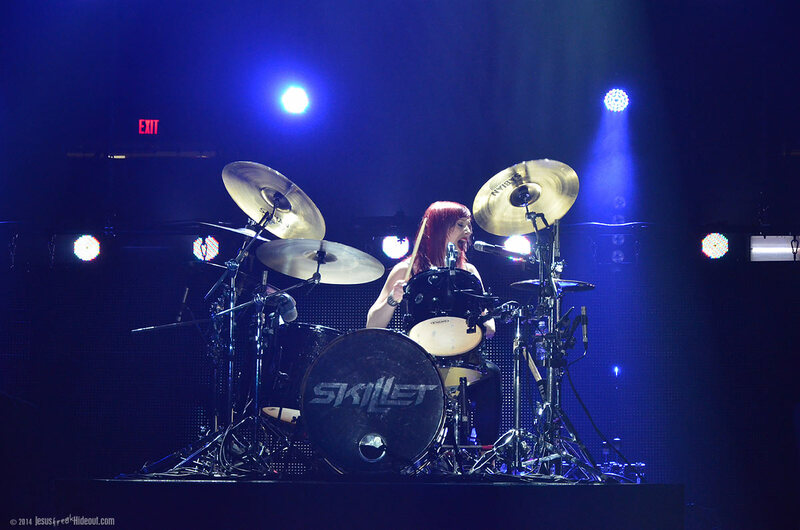 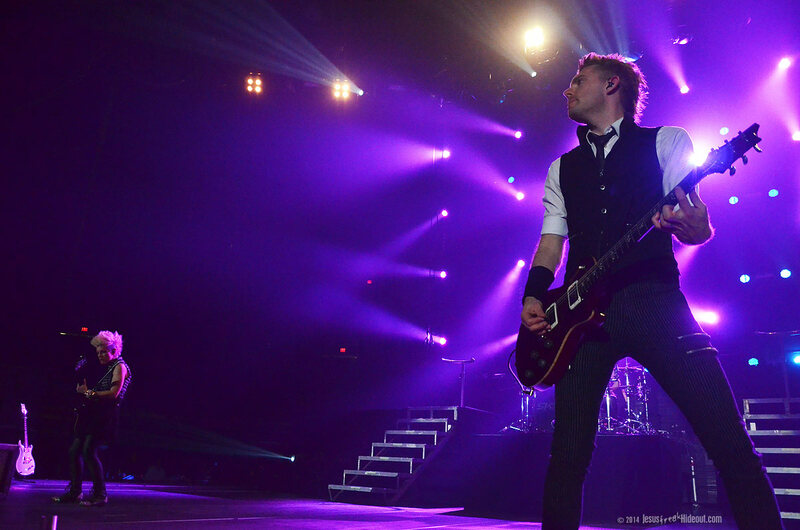 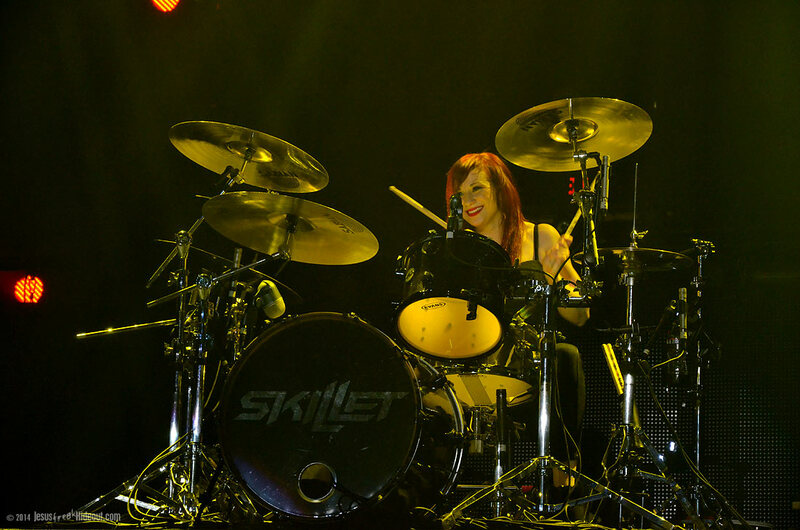 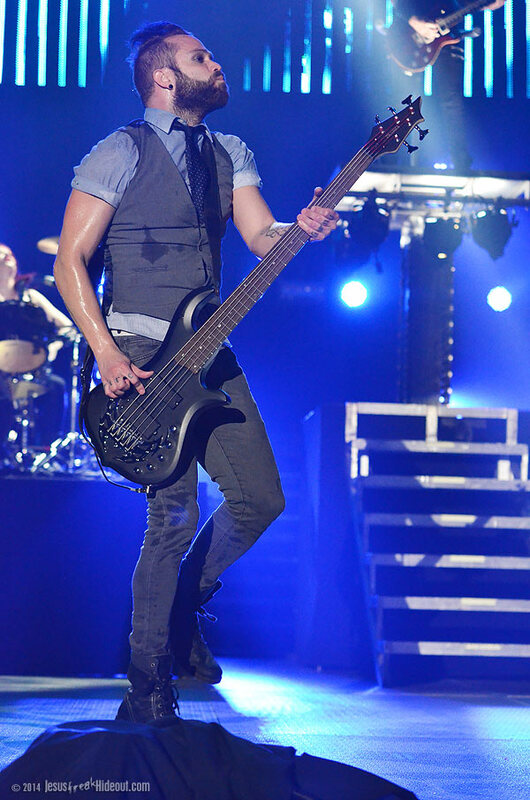 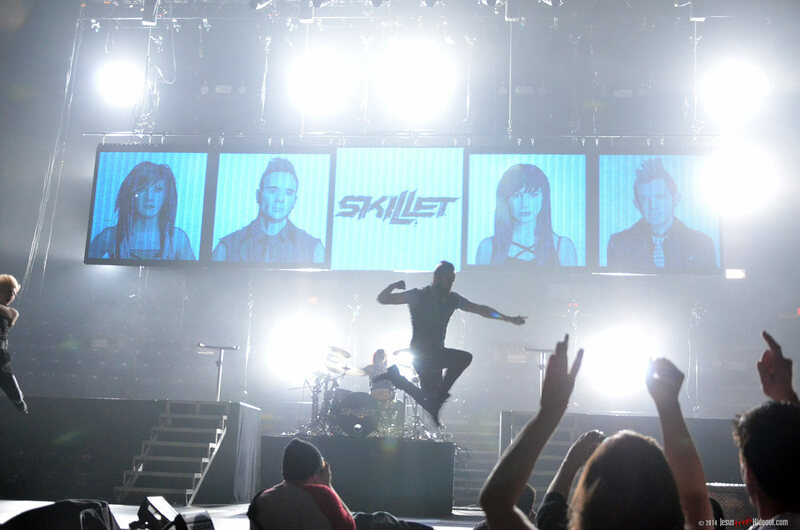 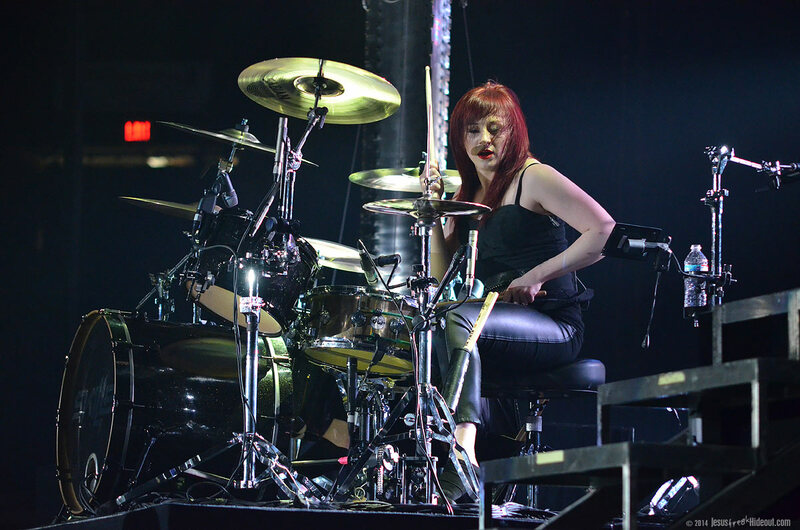 But as soon as the trio cleared the stage, the main stage was ready for Skillet's big rock show. 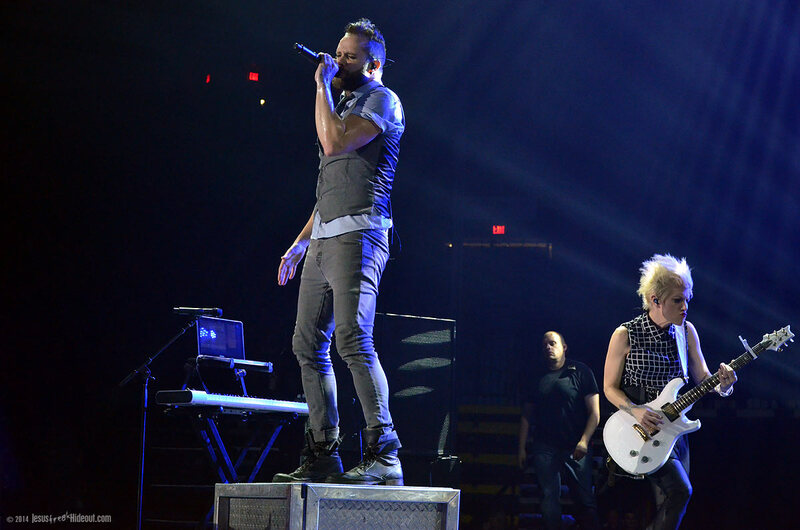 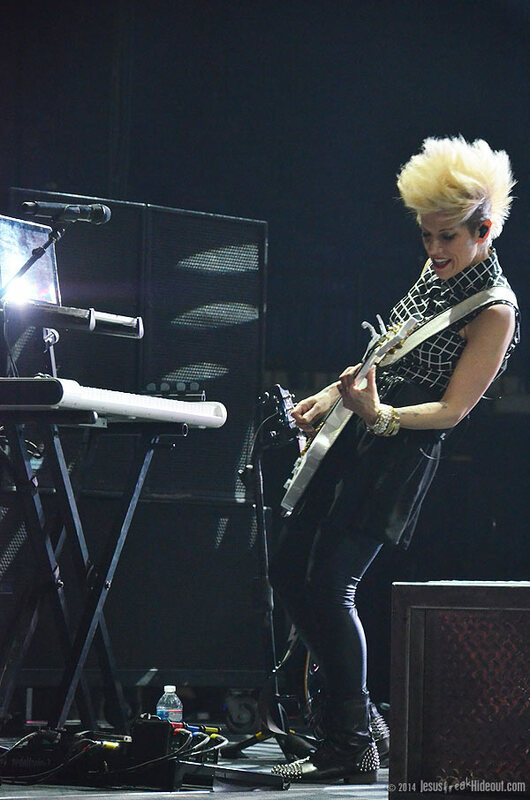 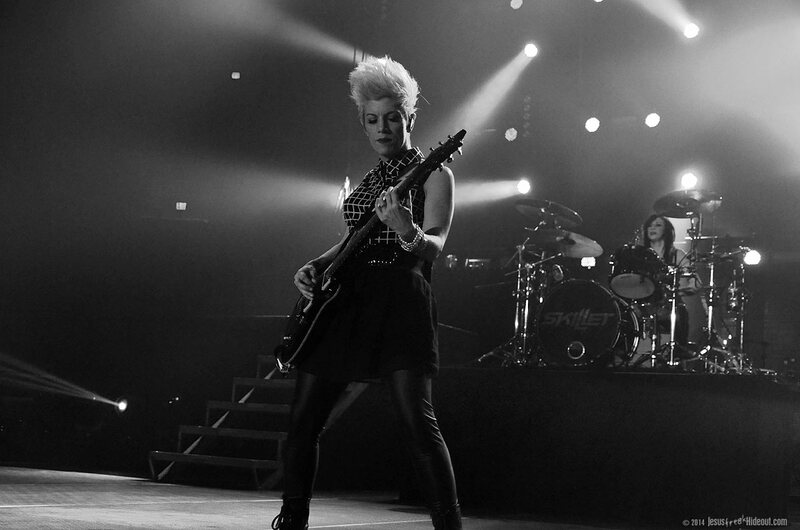 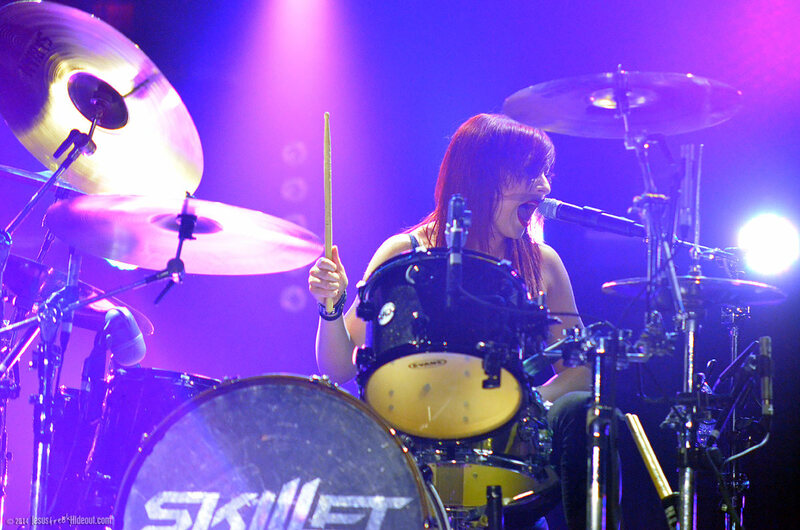 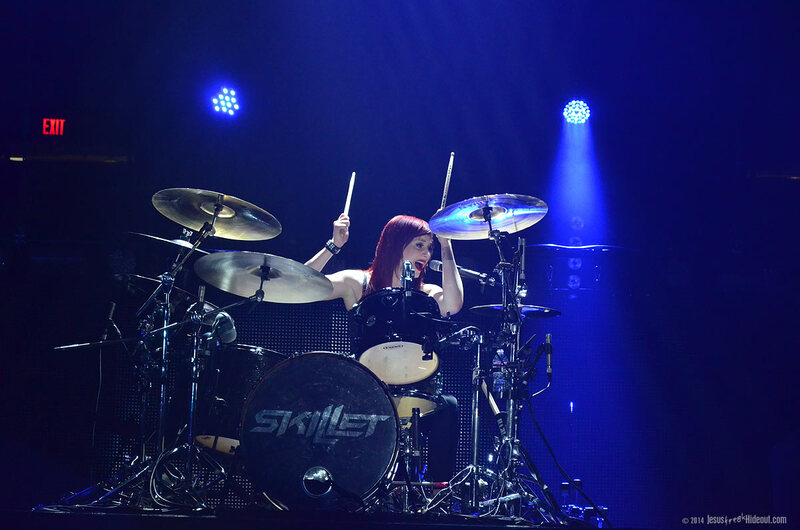 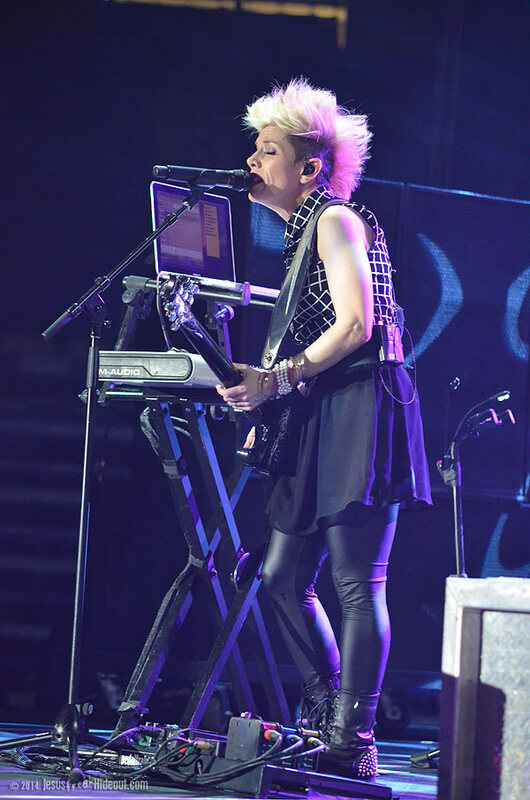 After a rousing video teaser and musical intro, Skillet exploded on stage with "Hero" from their hit album Awake and moved into the fan favorite "Sick of It" from their newest, 2013 release, Rise. 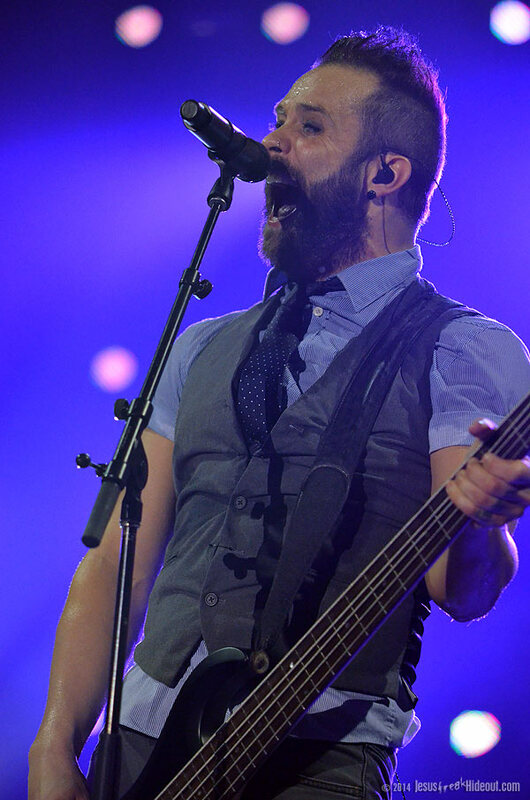 John Cooper has been sporting a new look this year with a trim beard cloaking his usually clean-shaven face, and a new do. 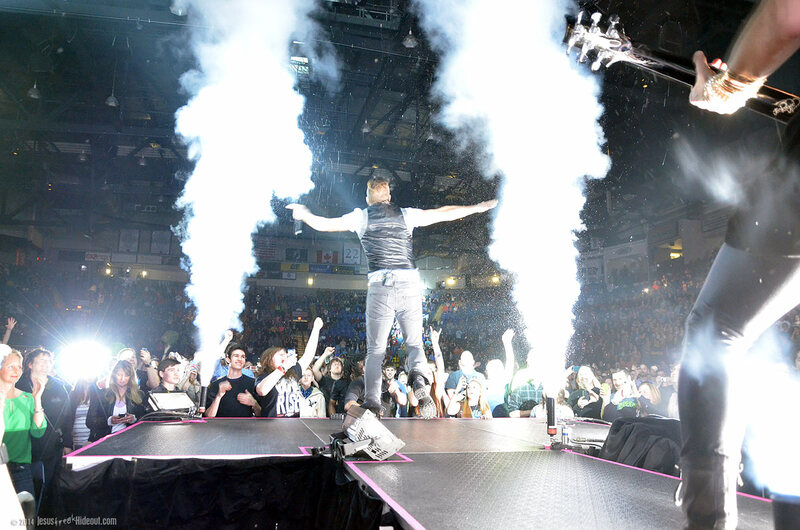 And since this was an indoor show, the jets of flame were replaced by air jets that would sparingly be used around the stage and catwalk. 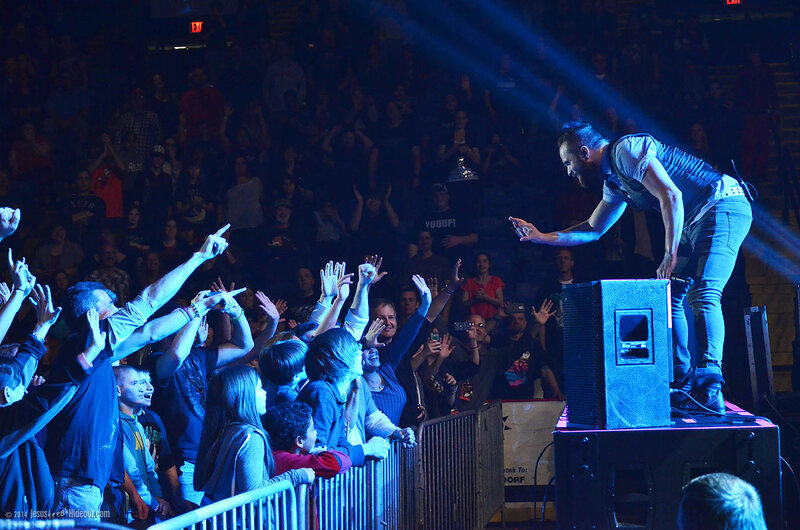 Comatose's "Whispers In The Dark" was next and then Cooper took a moment to introduce the band for "Those Nights." 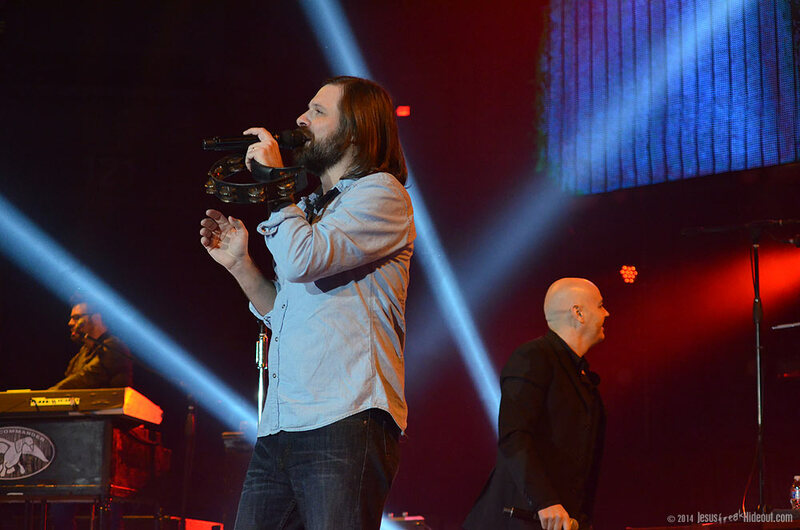 And, as fans can expect, John broke out a video camera to film the audience for YouTube from the stage. 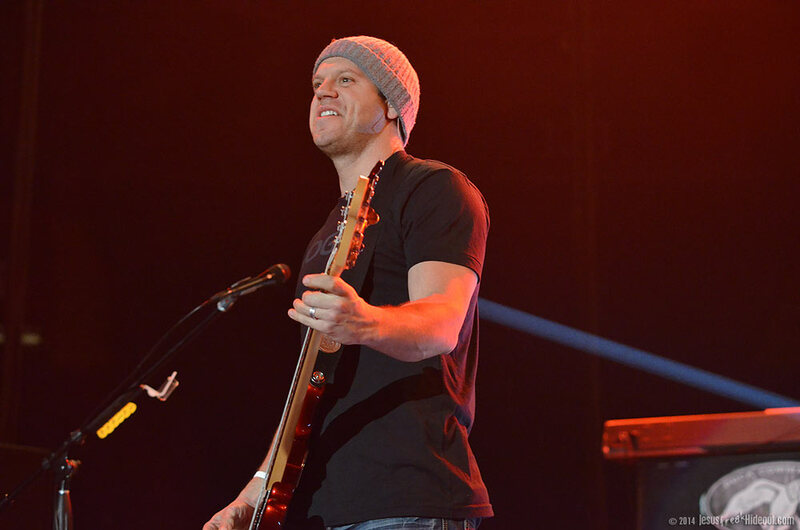 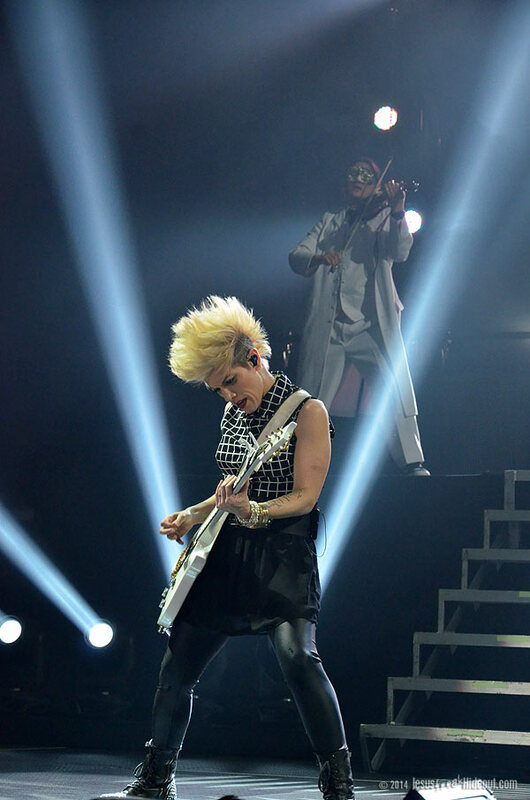 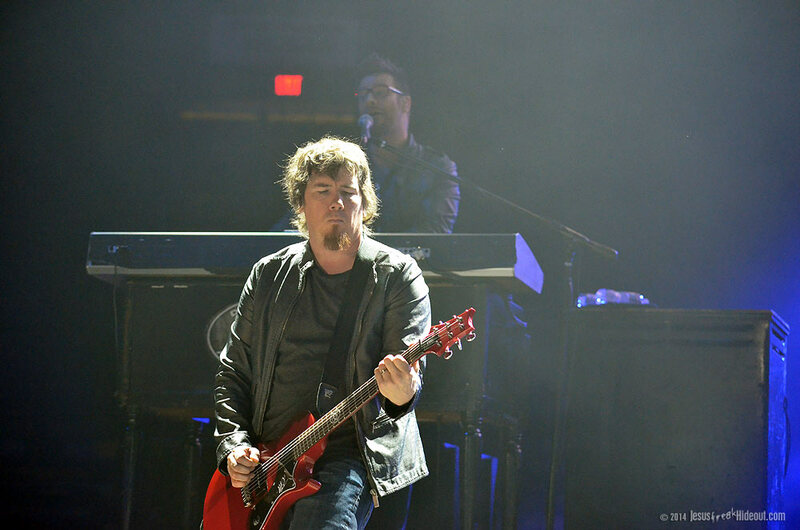 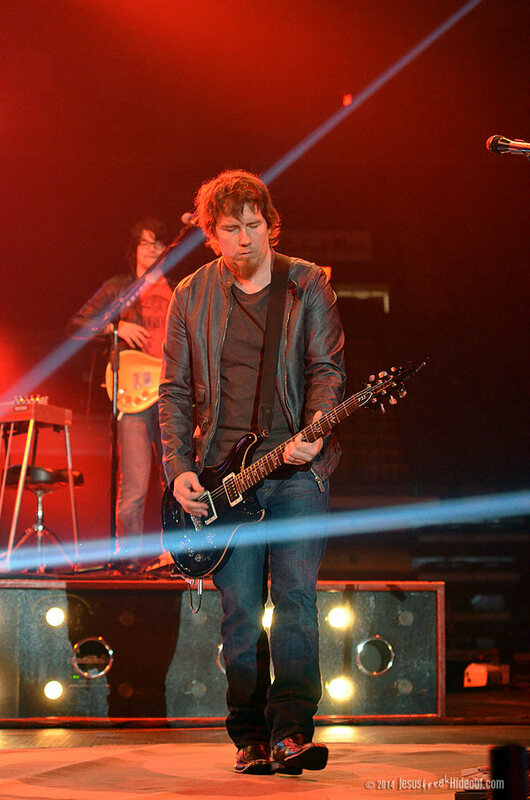 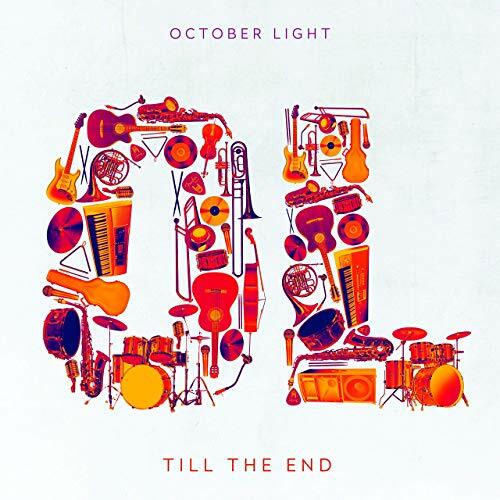 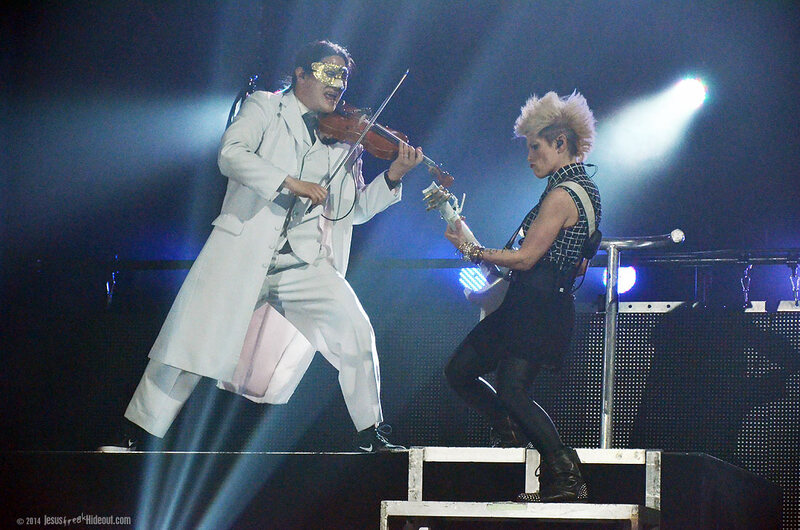 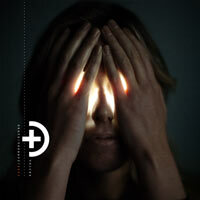 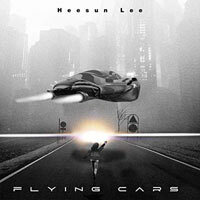 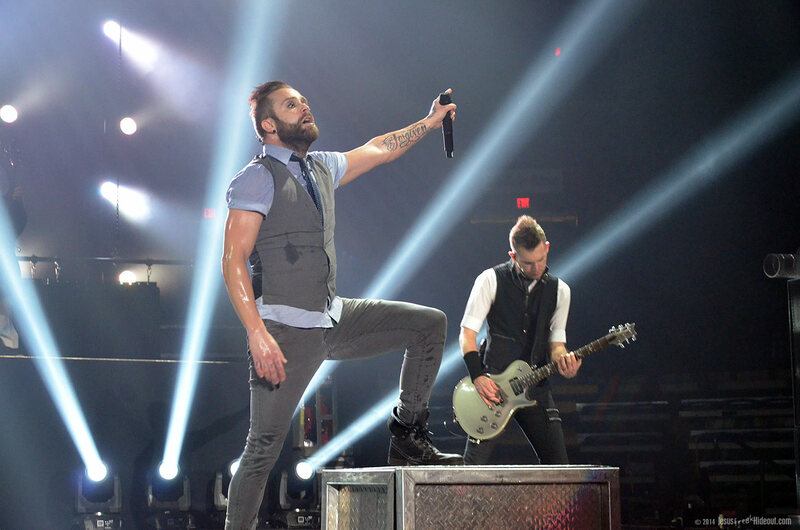 Their current single (and video), "Not Gonna Die," was next and then the anthemic "Awake and Alive" followed--complete with the string intro and the rising and lowering pedastals for guitarists Seth Morrison and Korey Cooper. 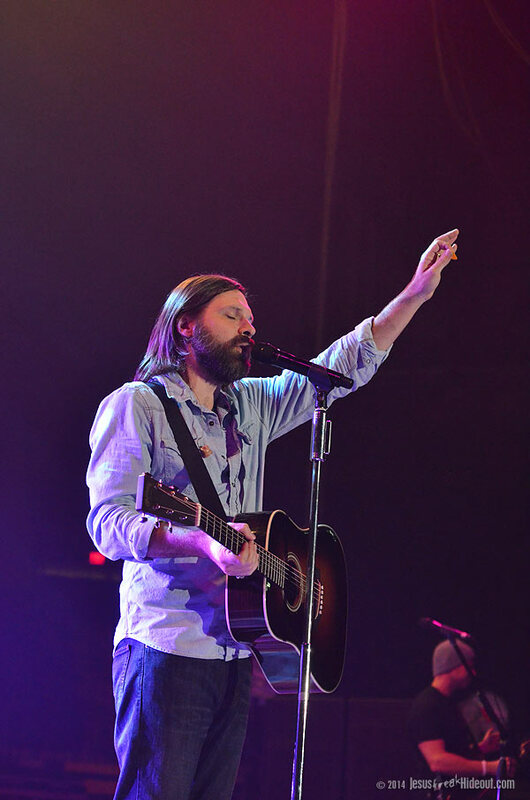 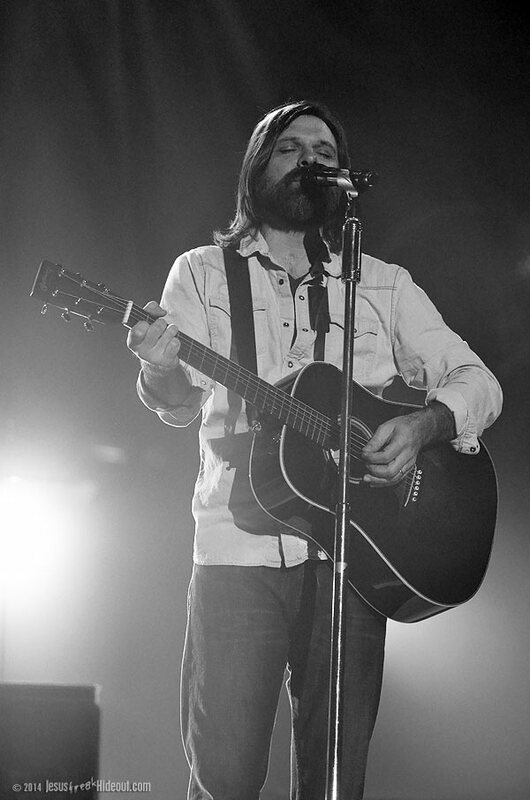 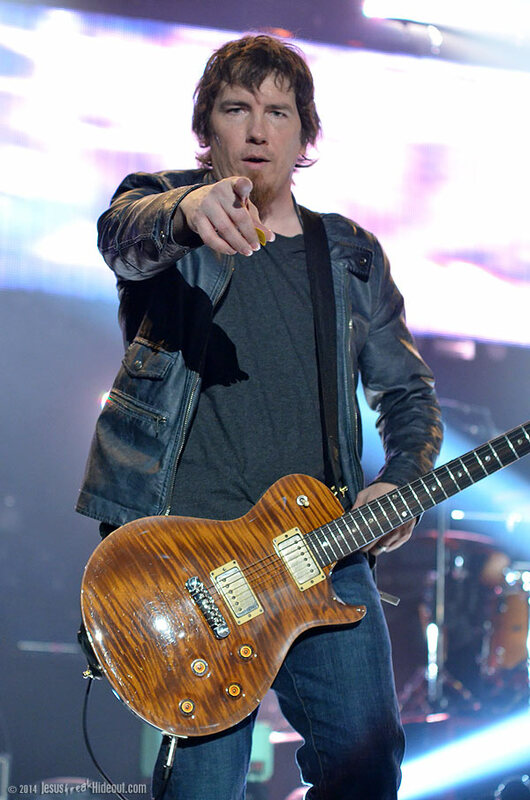 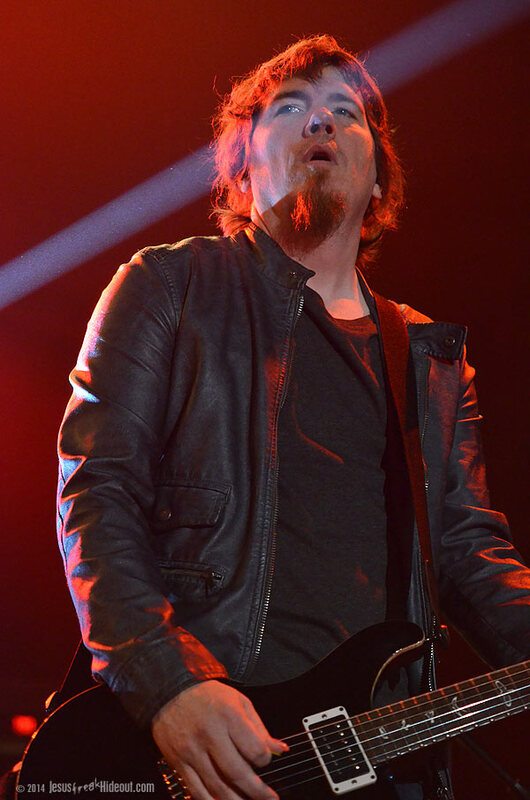 John then shared the story that inspired "The Last Night"--a song about a fan who wanted to commit suicide--and performed that song before breaking out the infectious "Monster" and the Comatose album opener, "Rebirthing." 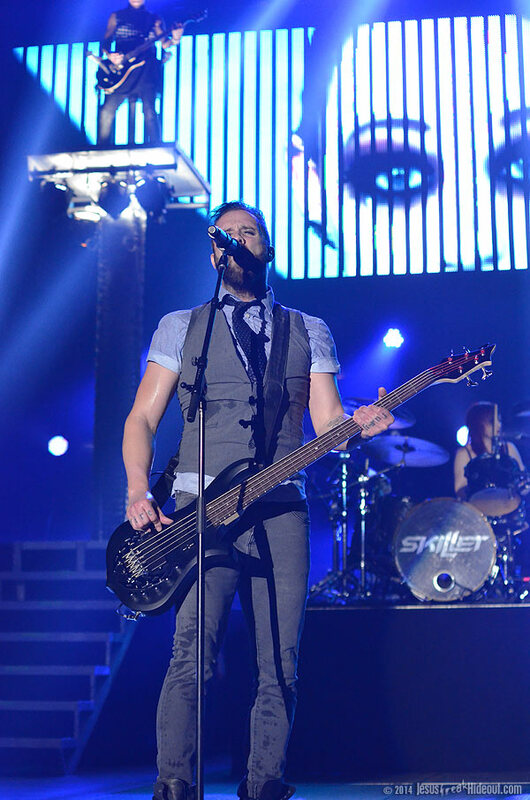 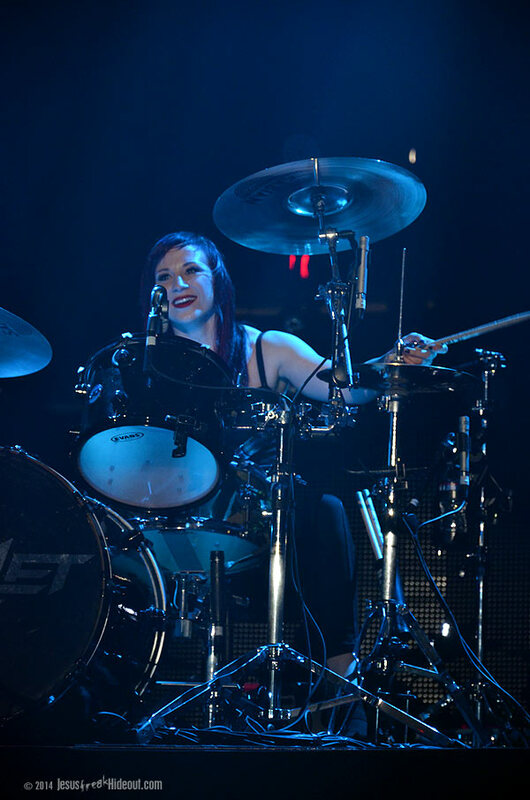 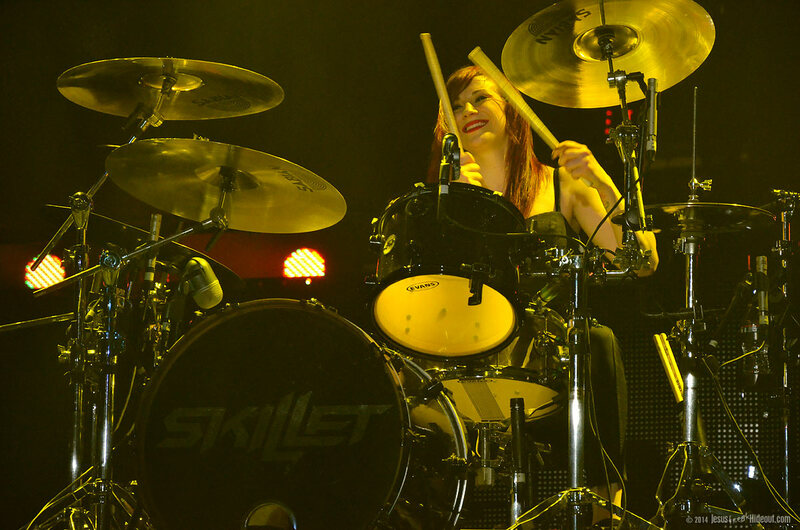 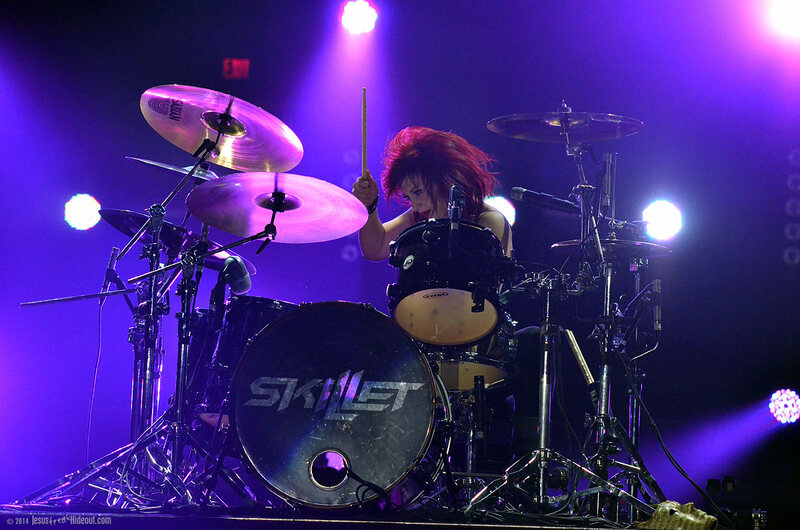 It was another energetic and fun show from Skillet that served as a solid closer for the night. 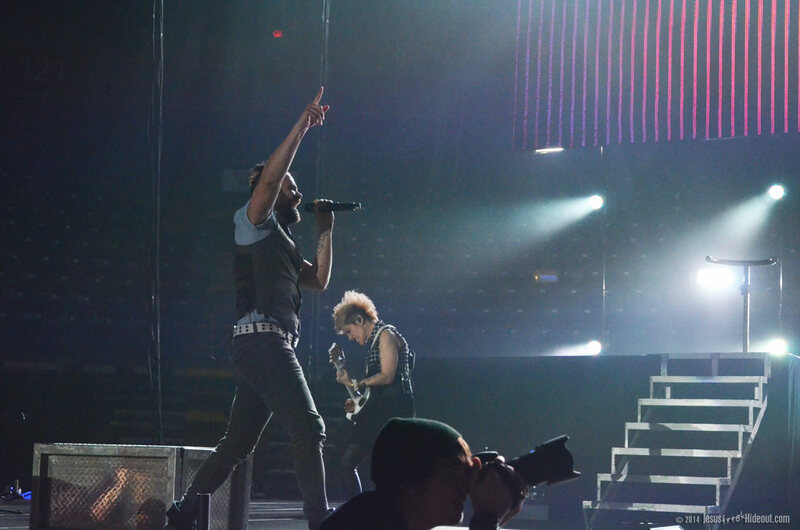 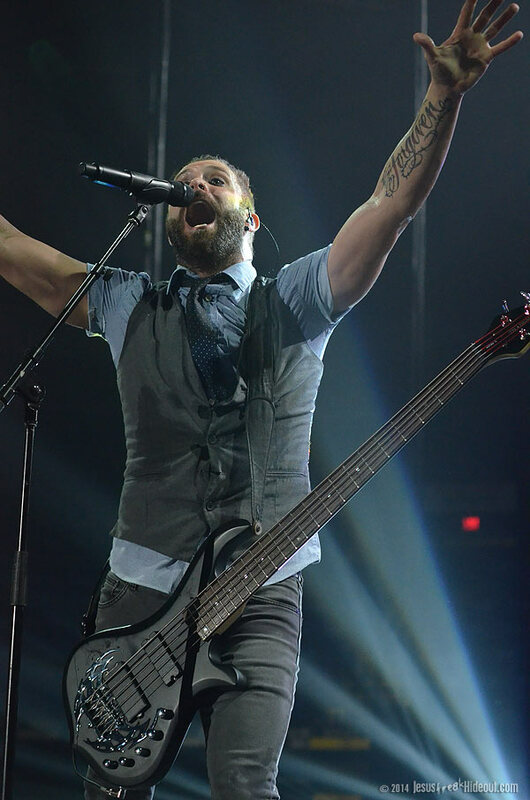 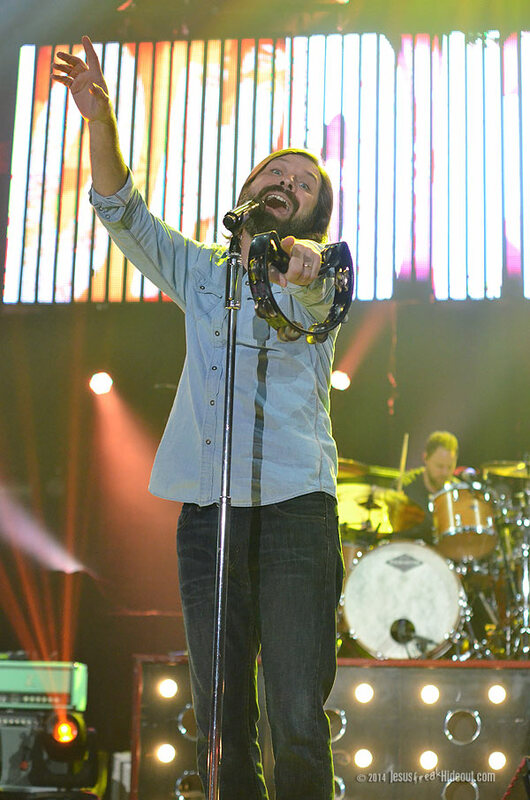 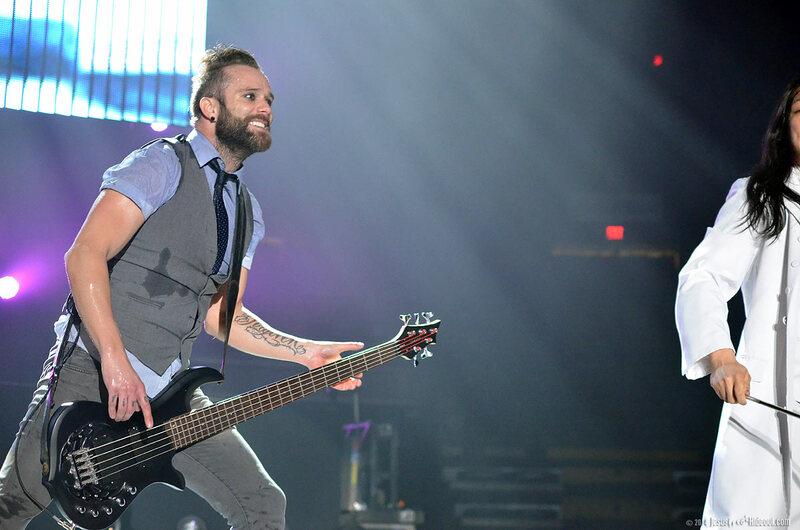 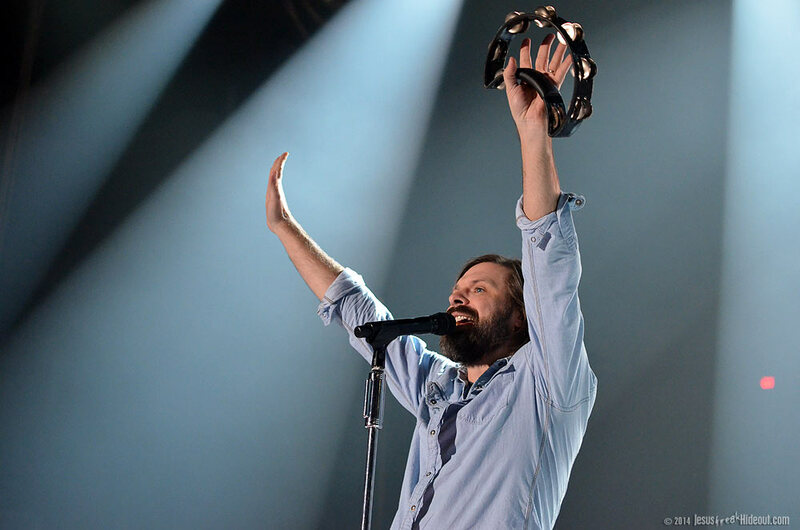 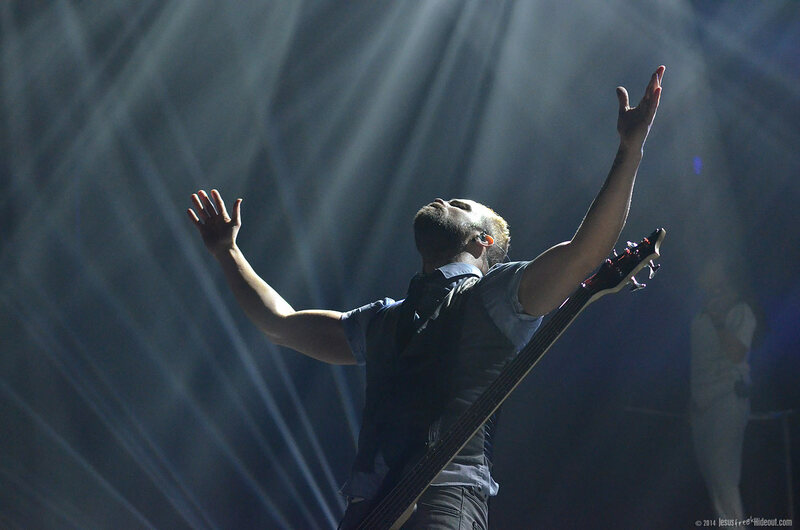 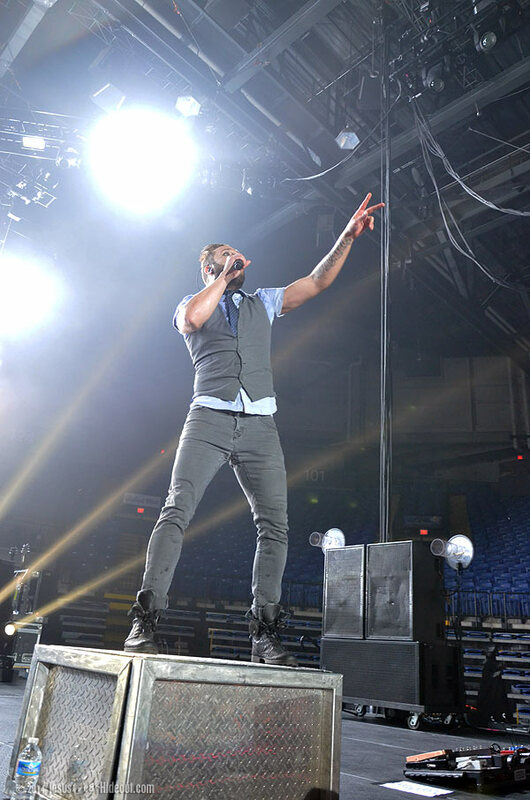 Whether you like just one of the artists on the roster for the night or all of them, the Third Day and Skillet Spring Tour is one fans won't want to miss. 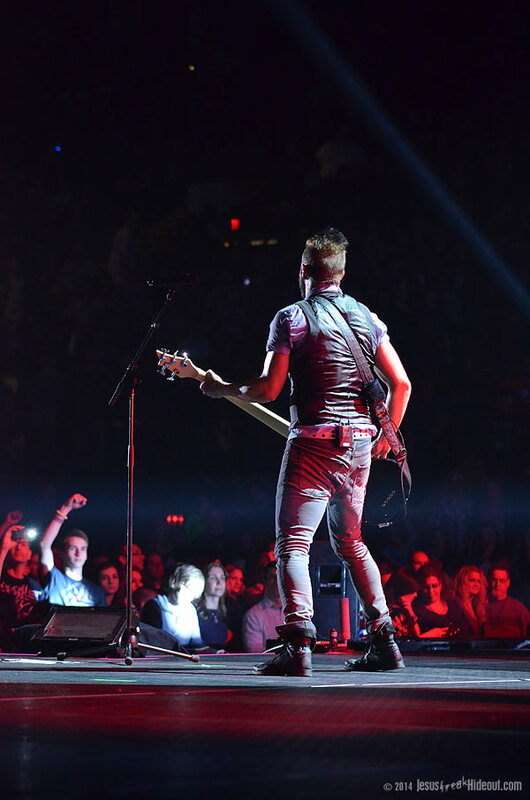 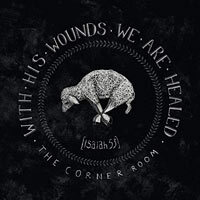 It's a little more intimate than the largely commercial formatting of Winter Jam, and a bit more generous on the set times than something like the Hits Deep Tour, making it another major spring tour that will create lasting memories for anyone who attends.